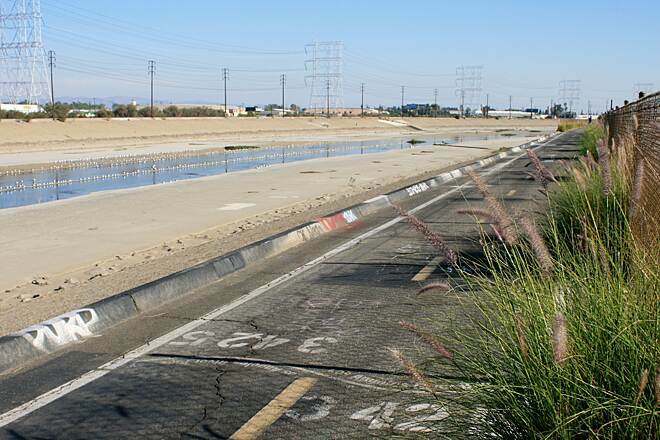 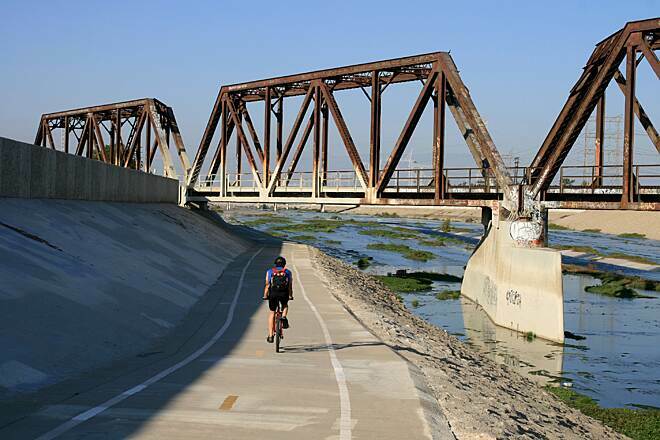 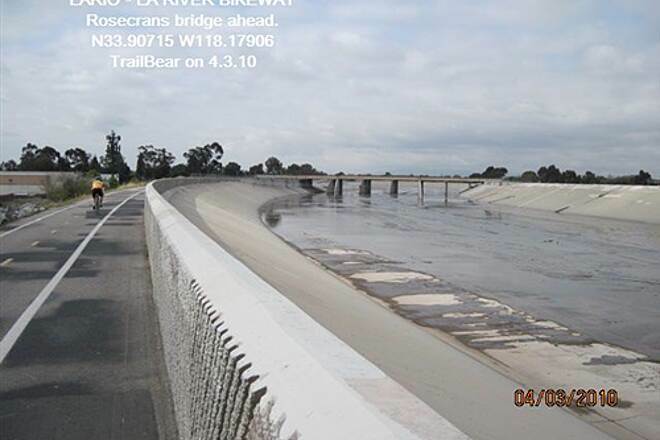 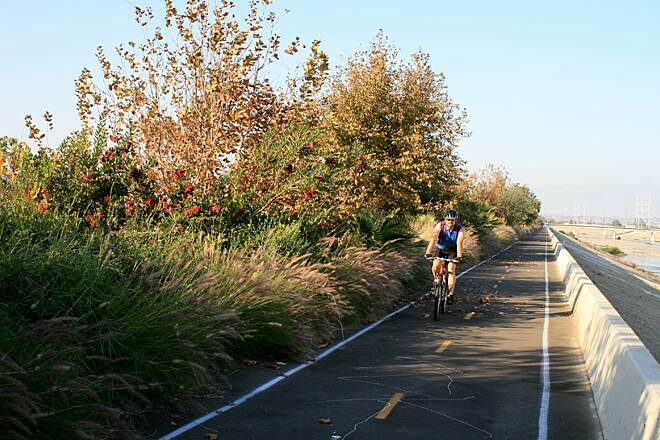 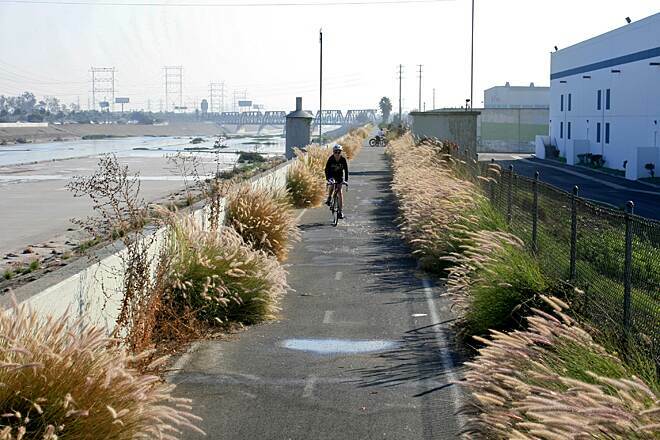 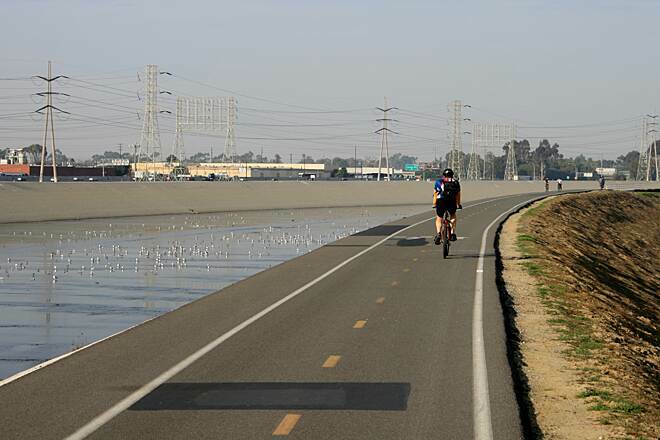 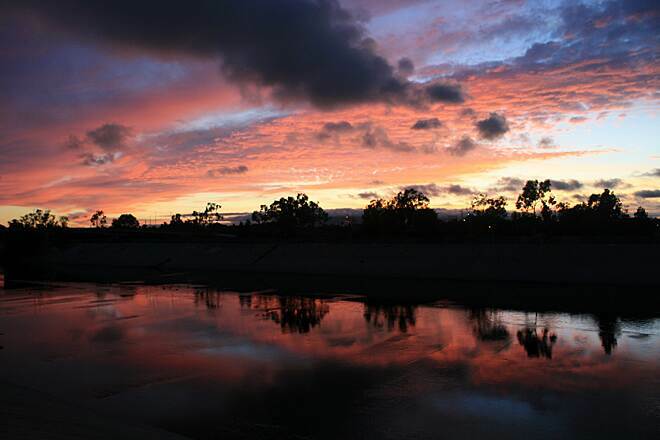 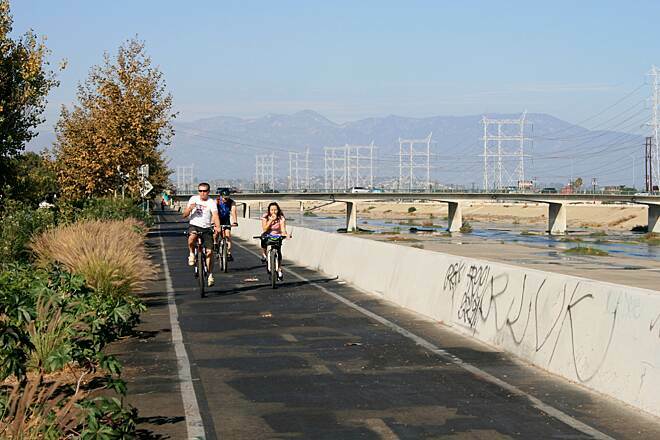 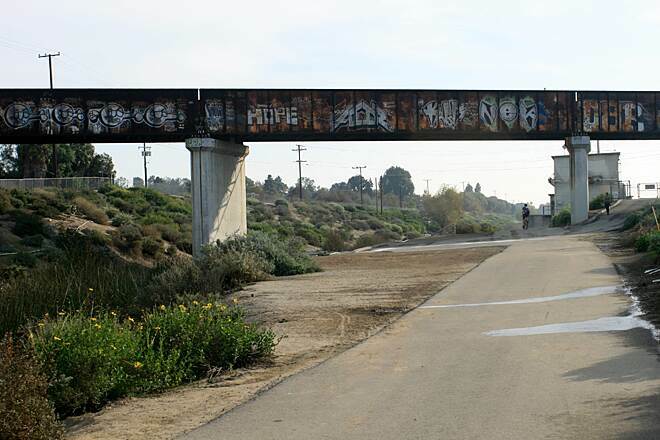 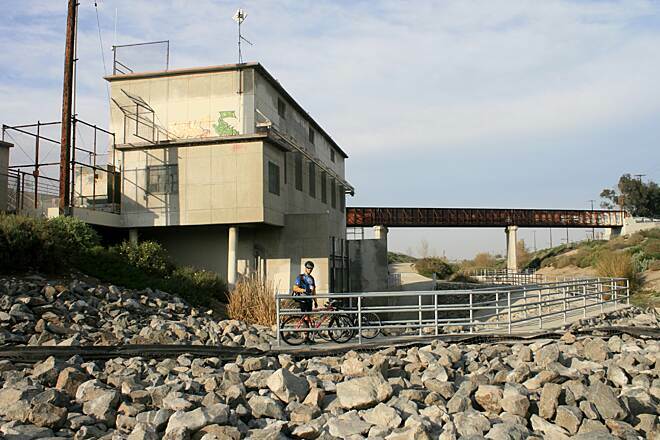 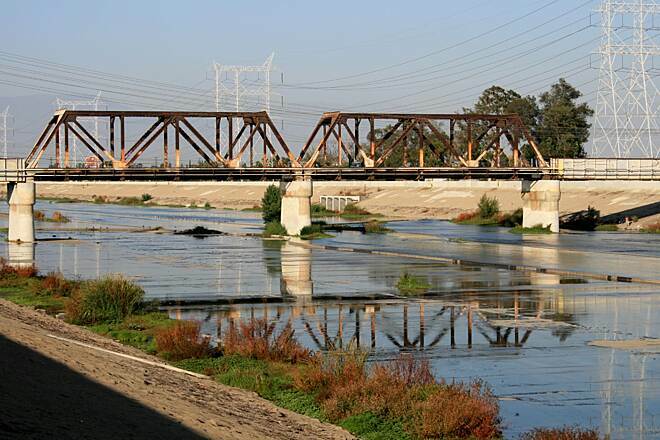 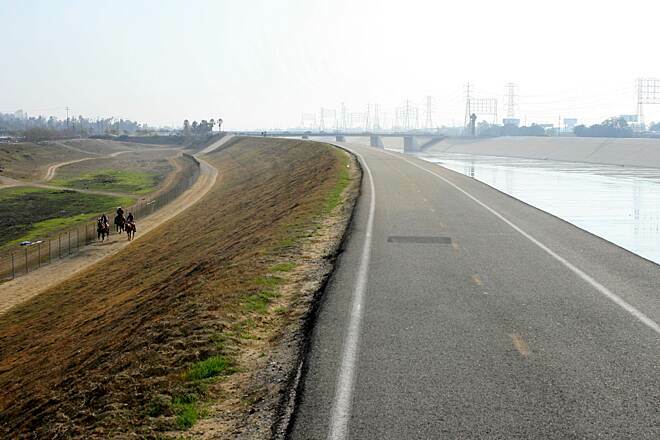 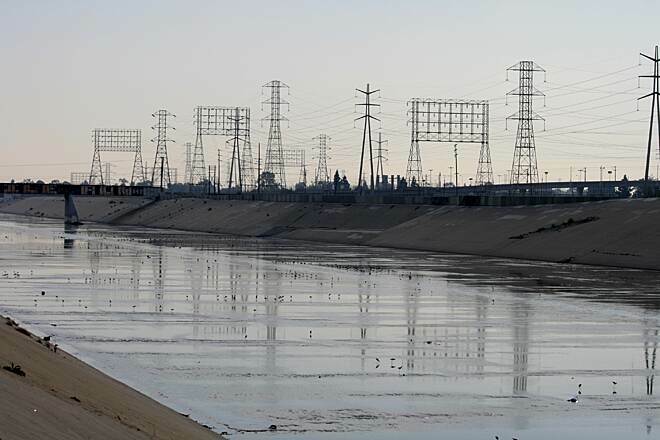 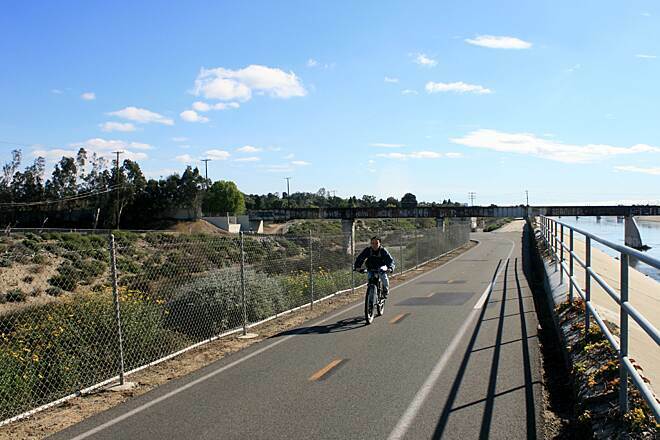 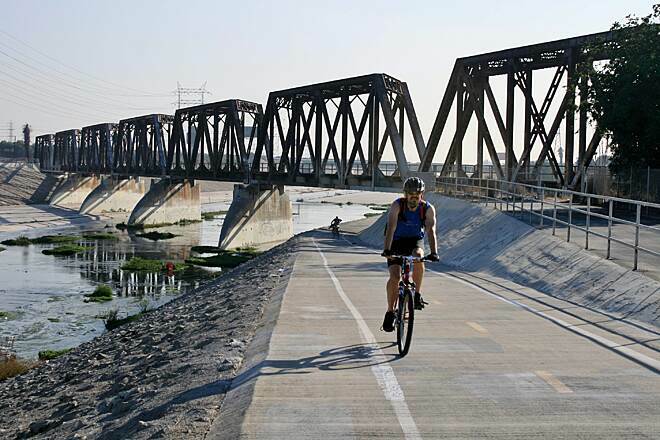 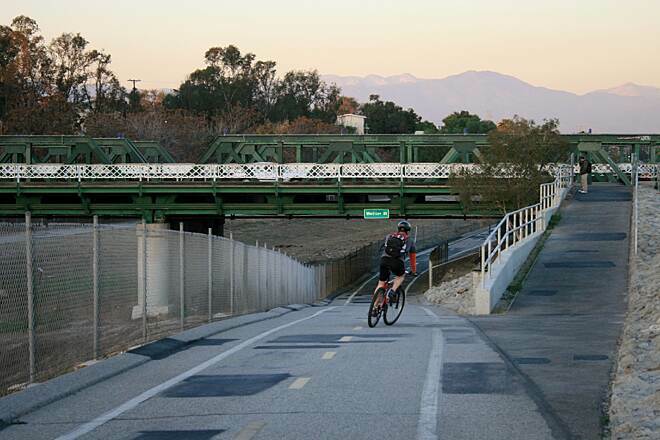 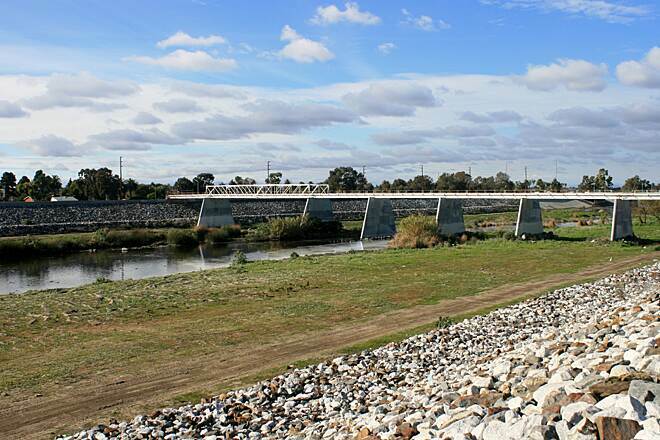 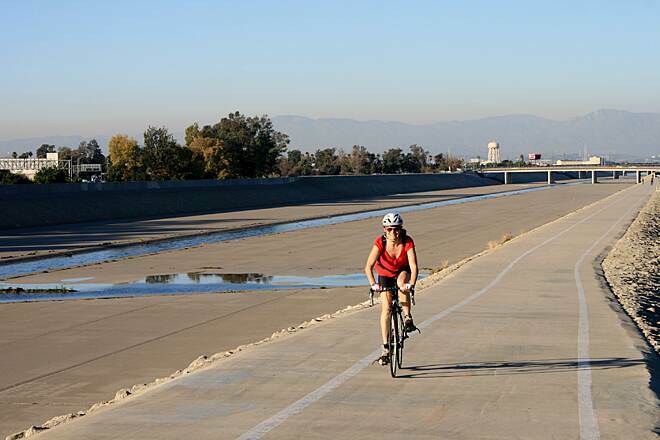 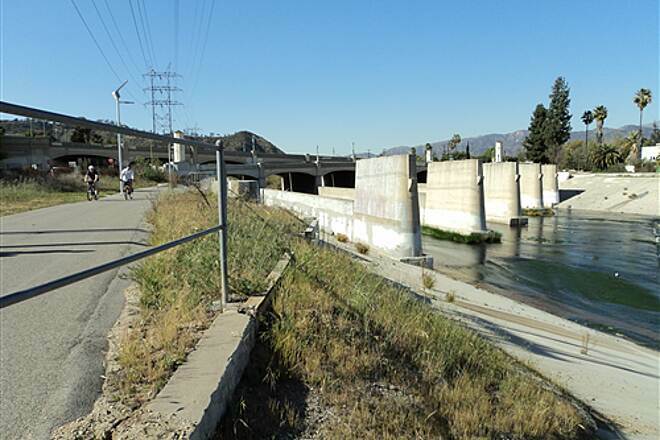 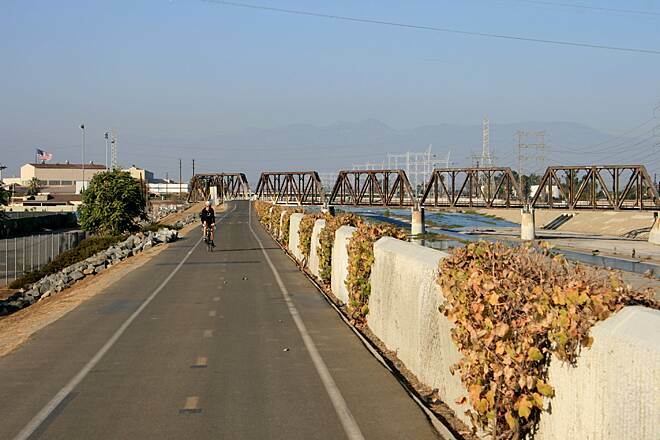 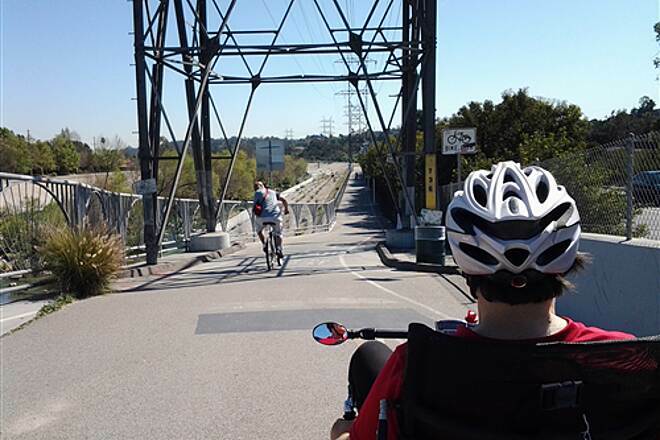 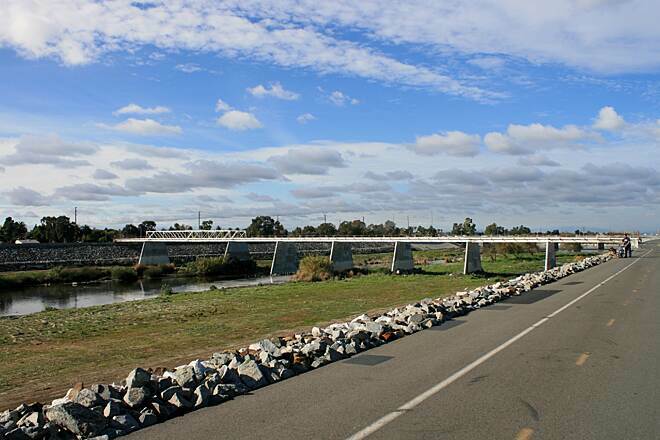 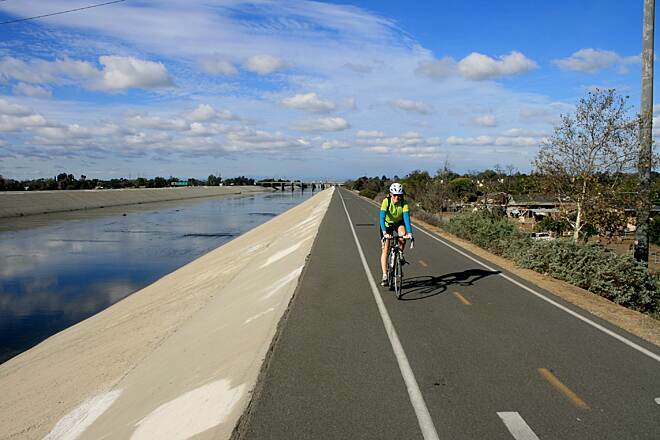 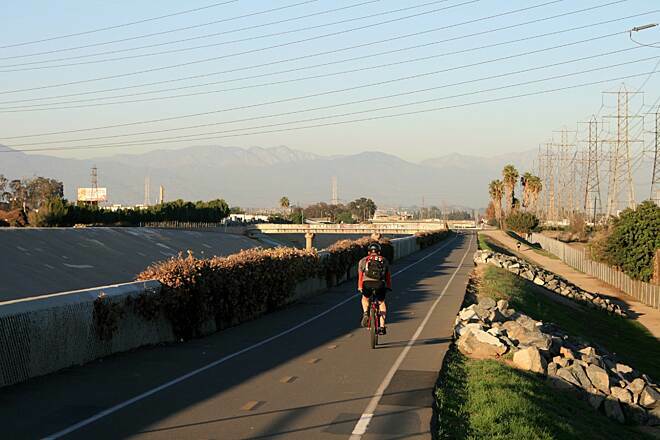 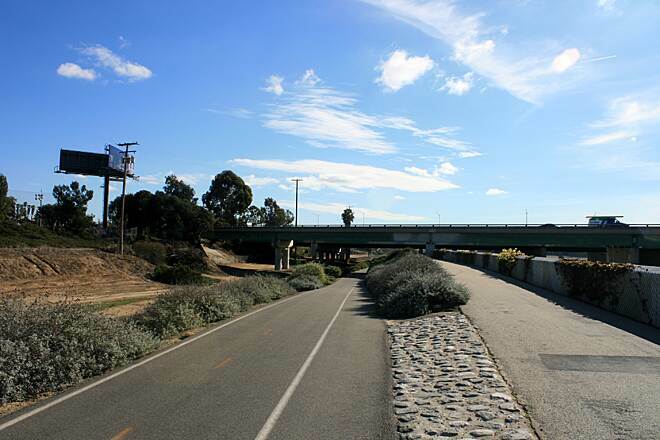 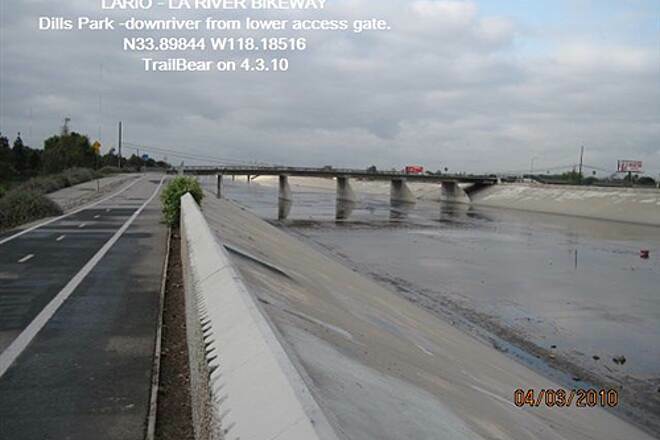 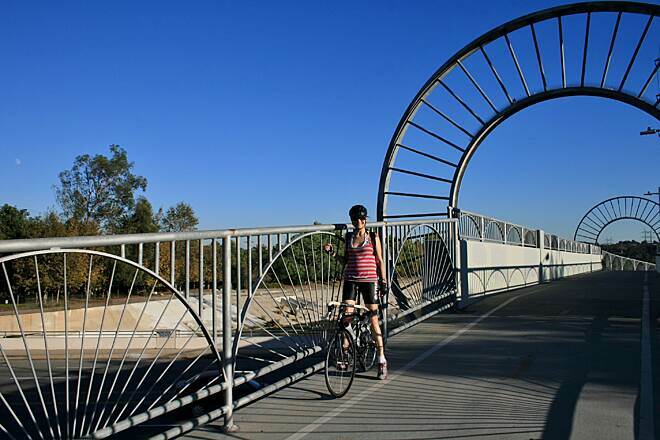 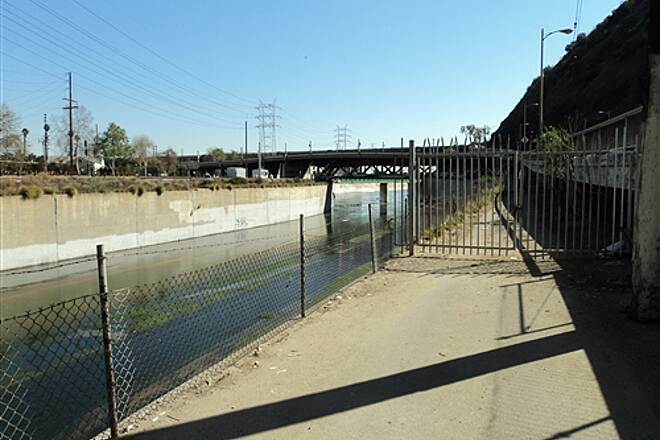 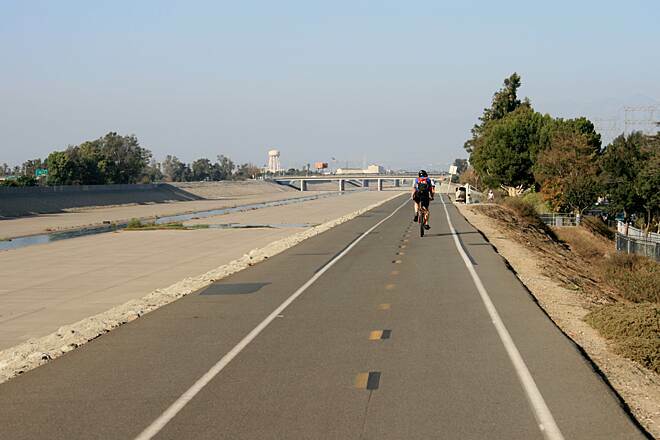 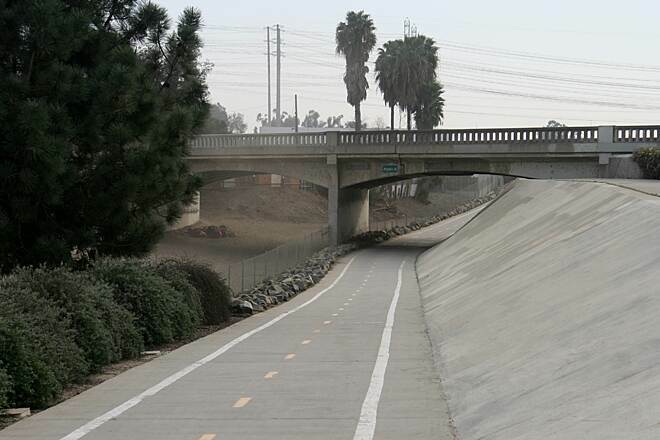 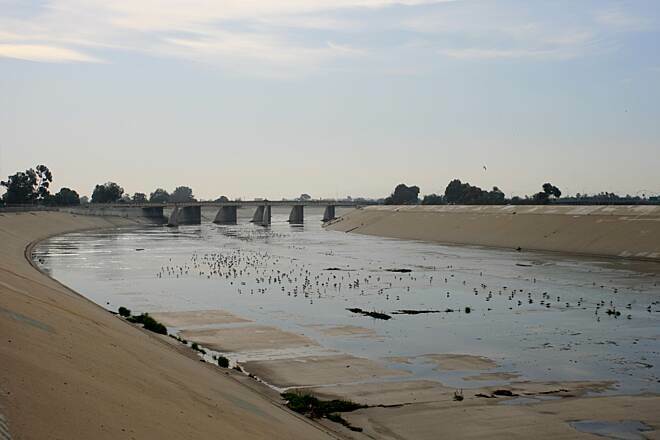 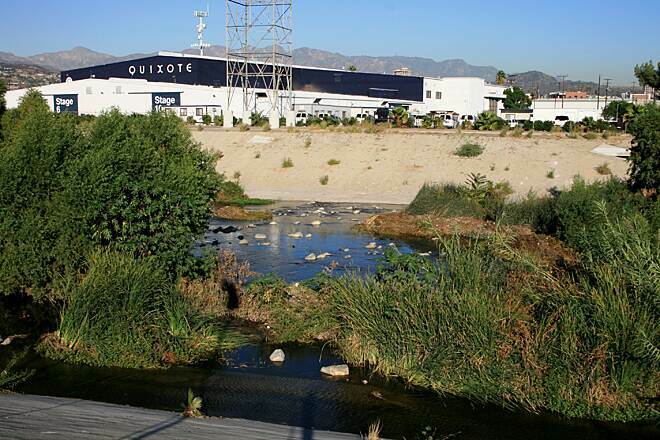 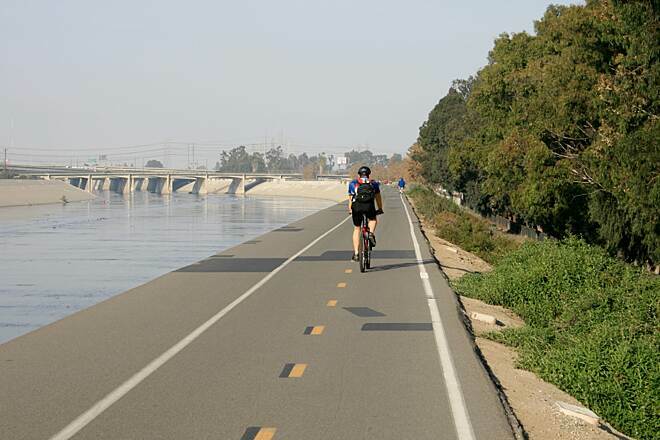 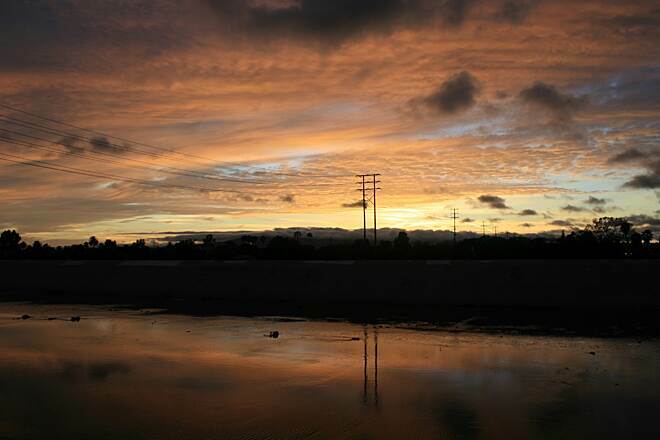 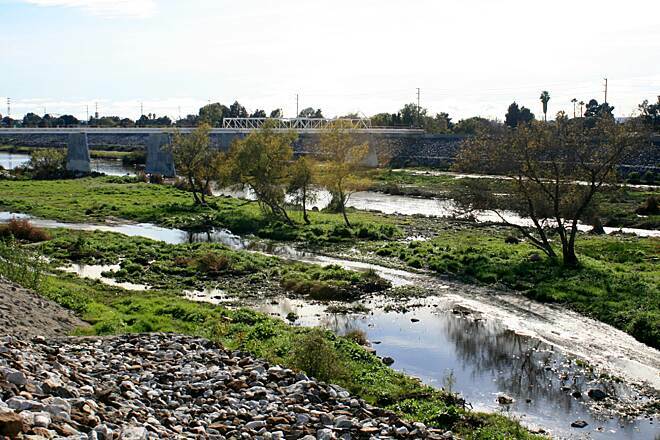 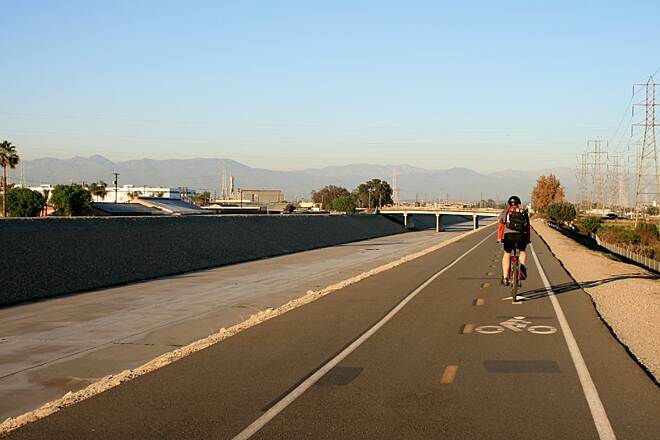 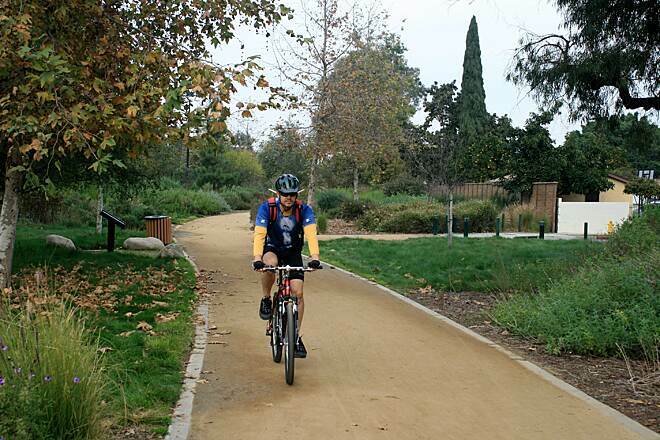 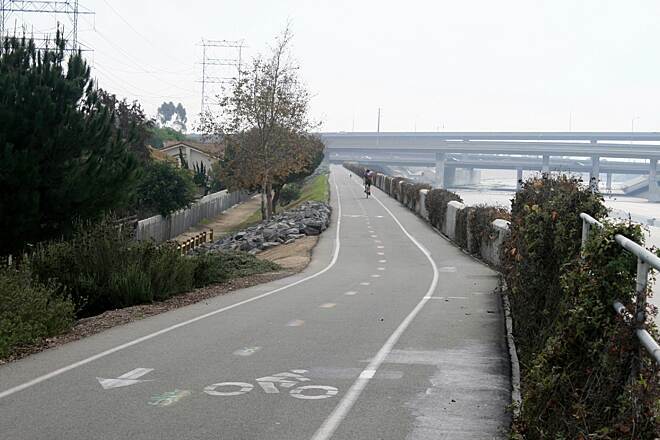 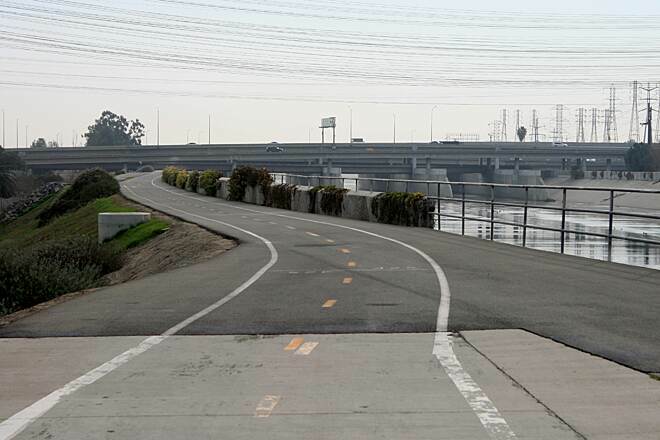 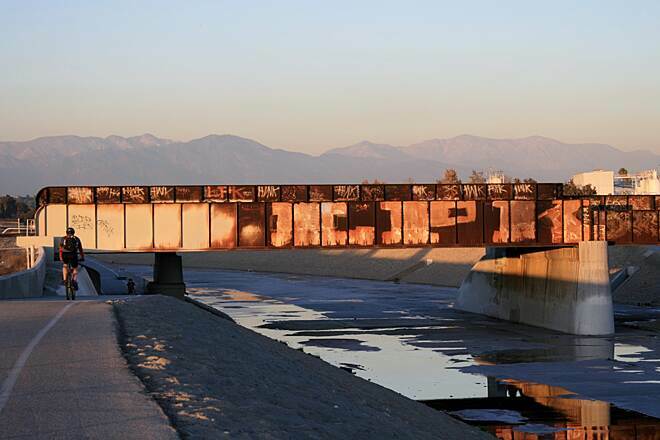 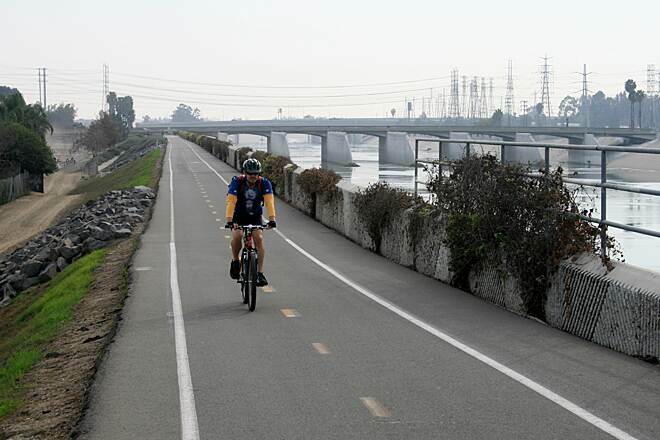 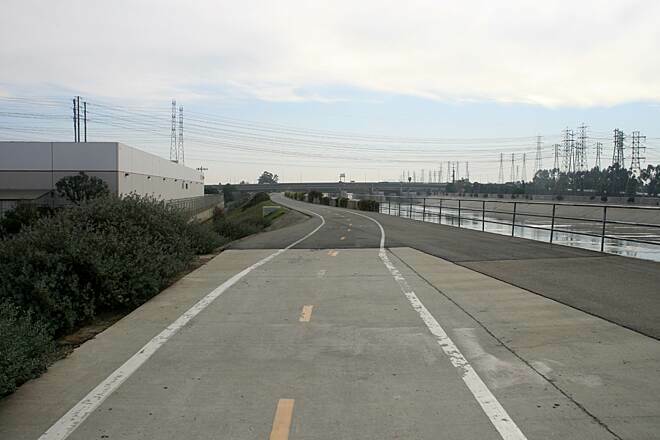 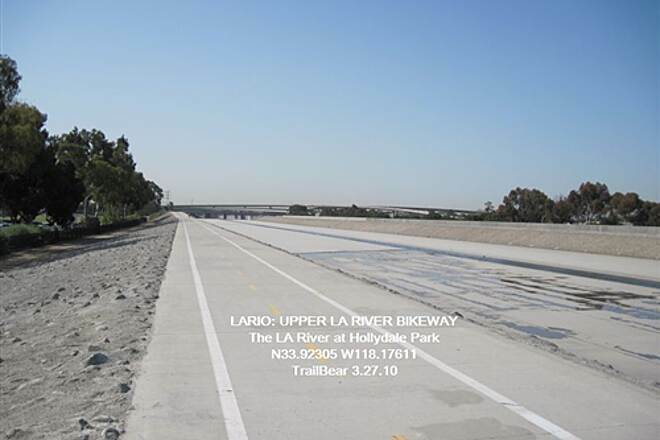 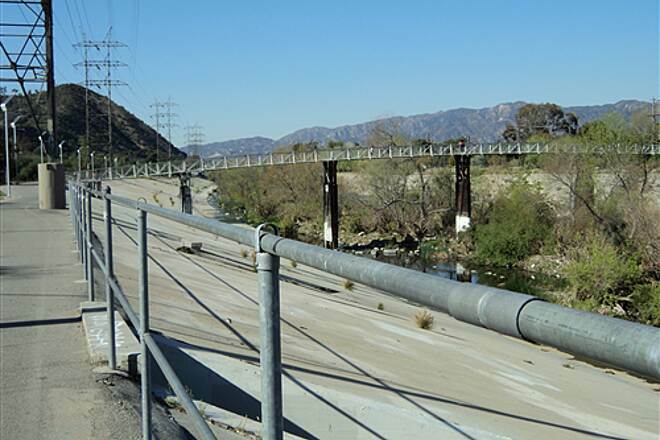 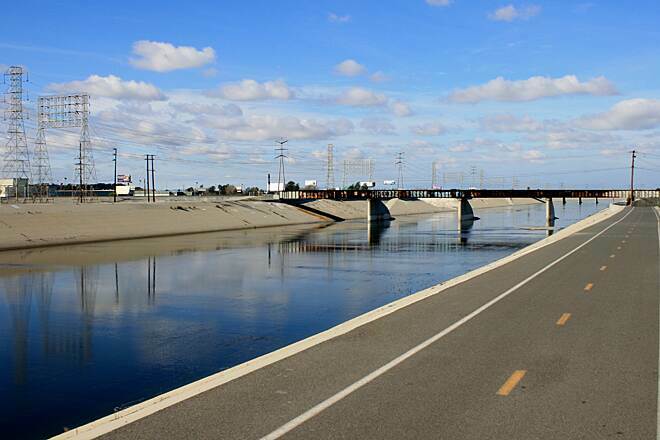 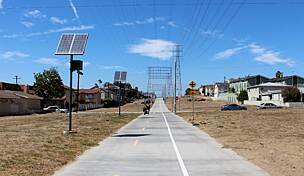 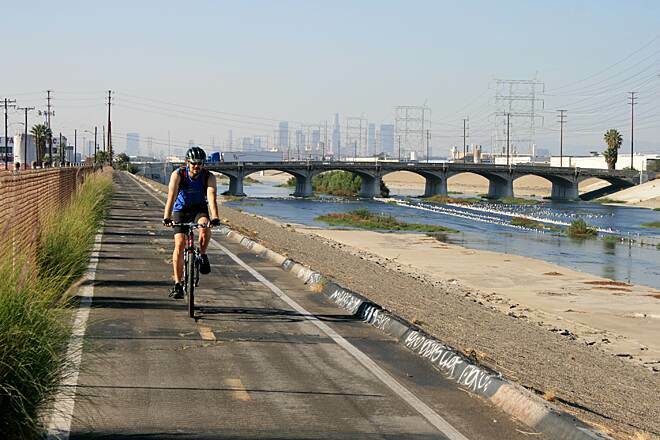 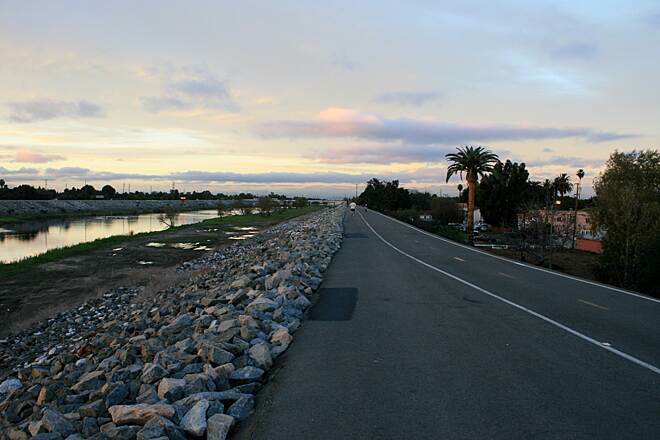 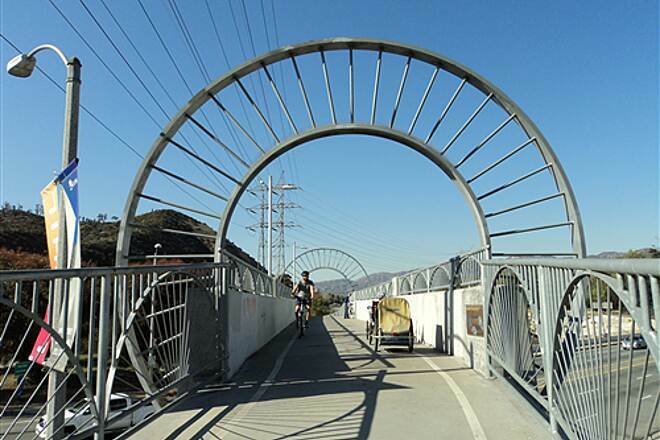 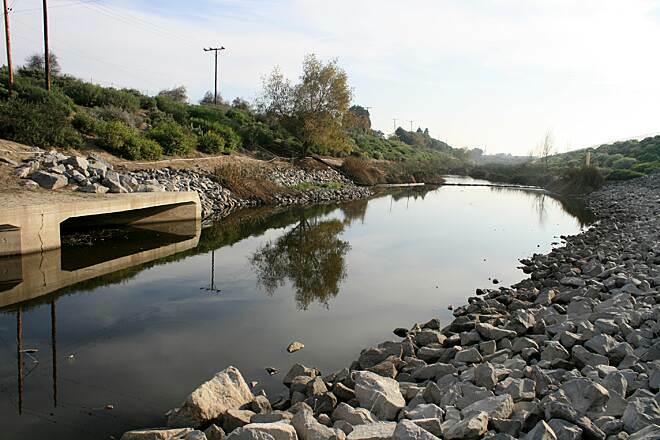 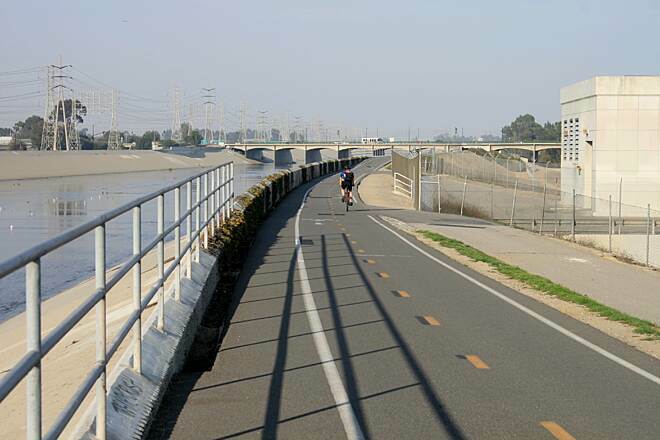 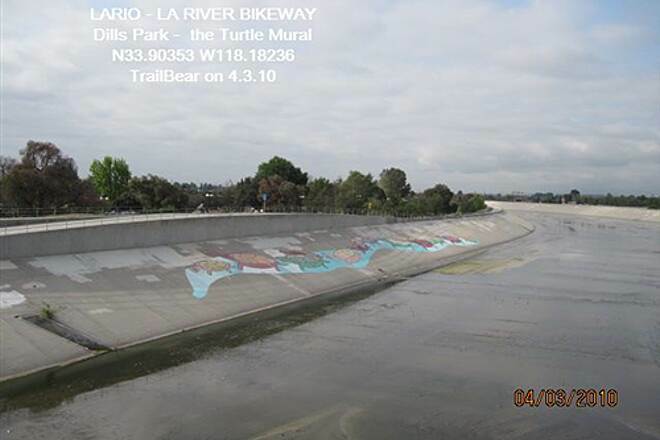 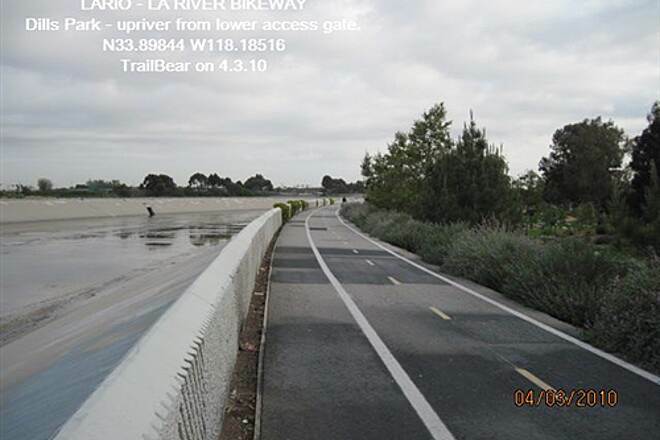 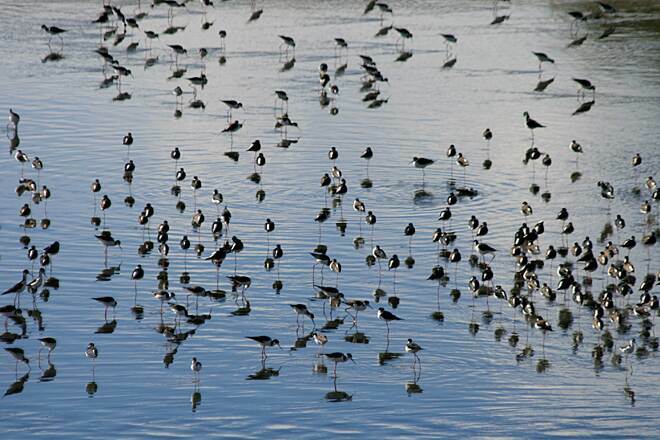 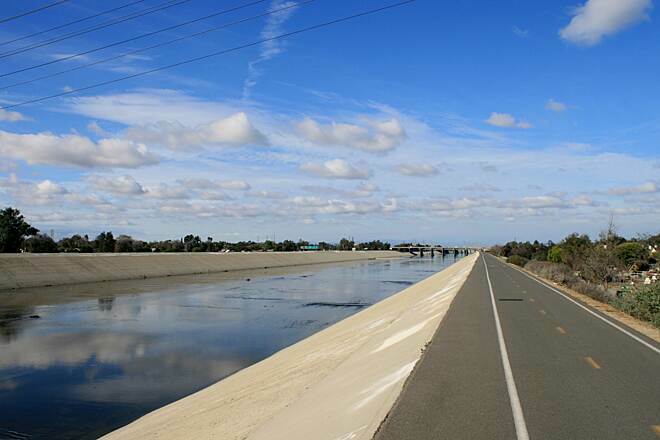 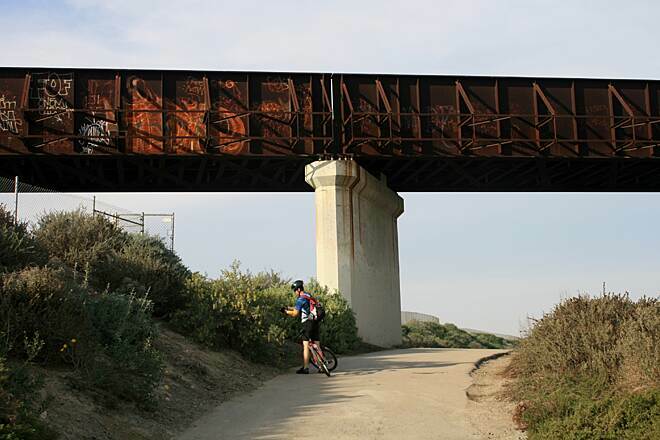 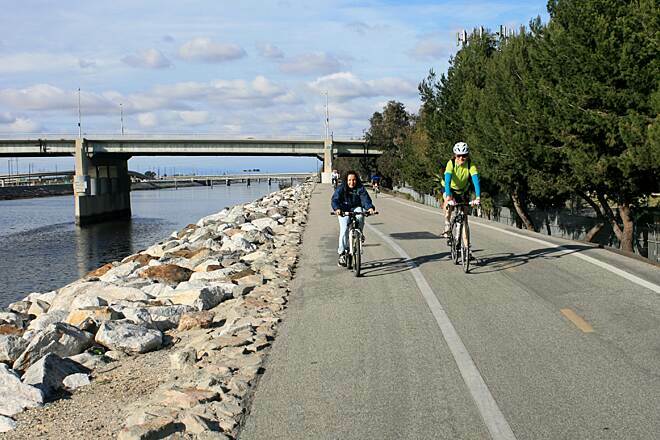 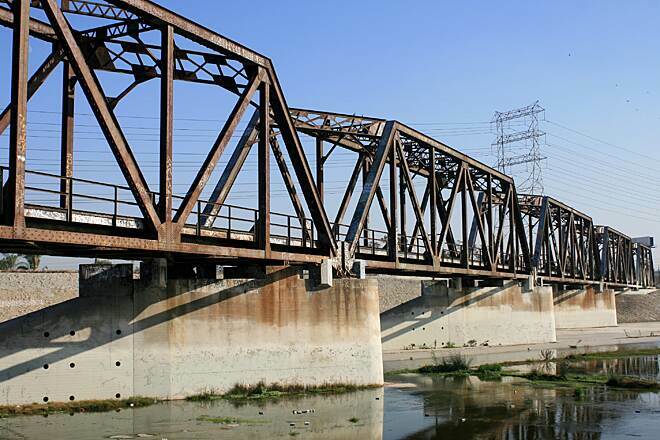 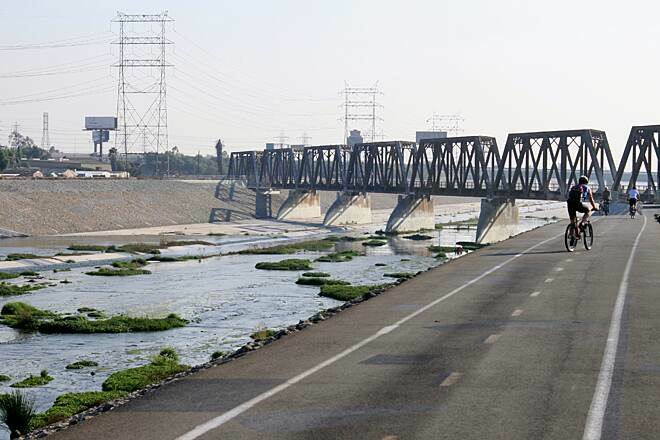 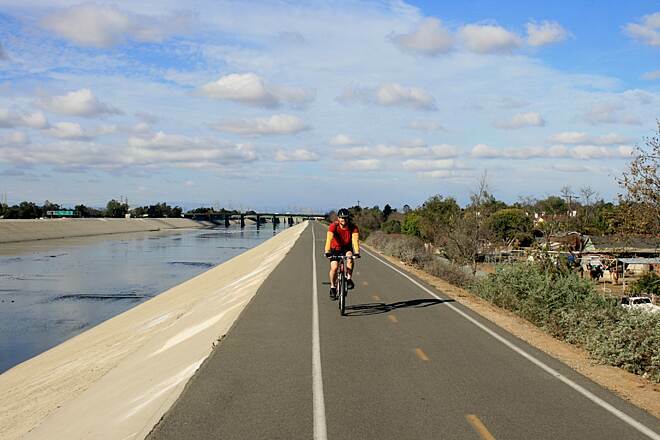 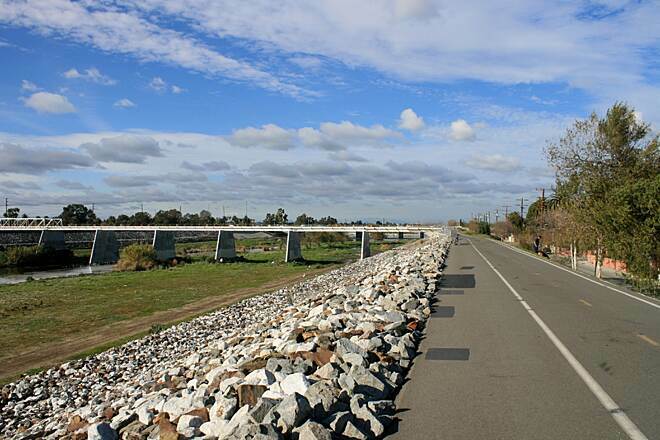 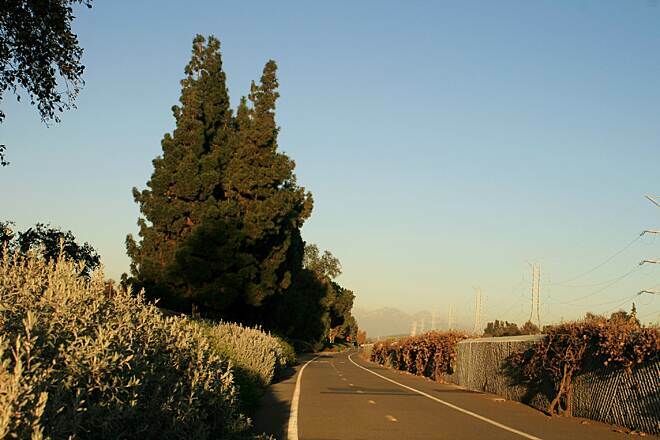 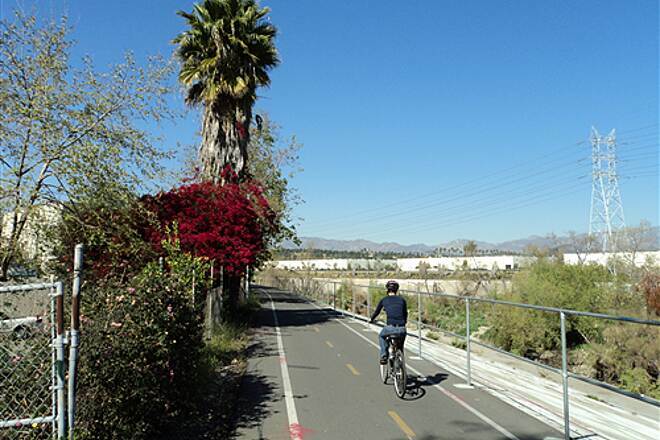 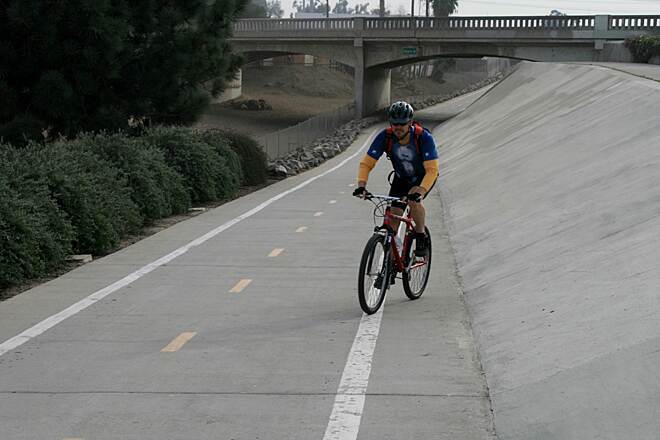 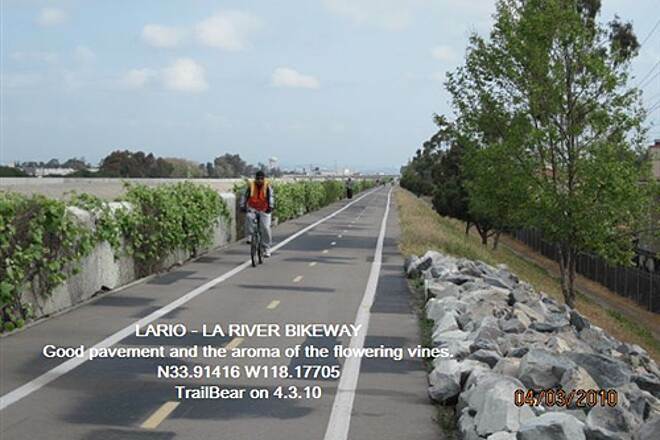 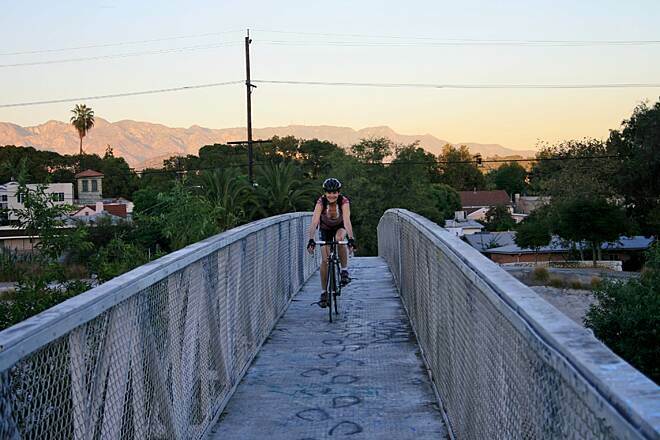 The paved Los Angeles River Trail—also known as the Los Angeles River Bike Path, Los Angeles River Bikeway, Los Angeles River Greenway Trail and Lario Trail—is open in two disconnected segments along its namesake waterway in Los Angeles County. 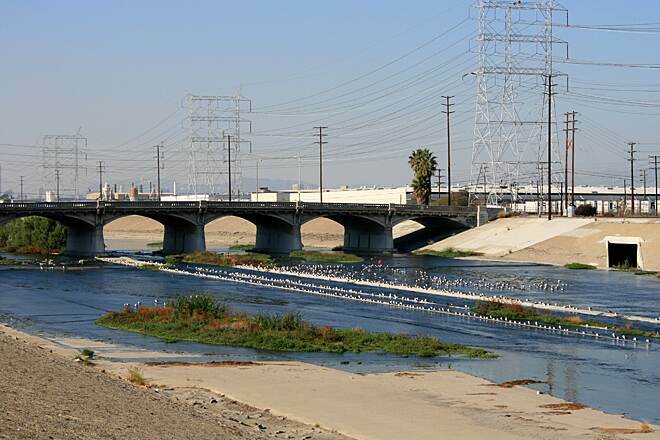 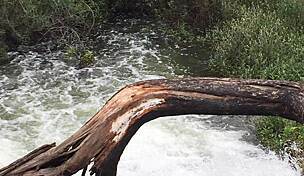 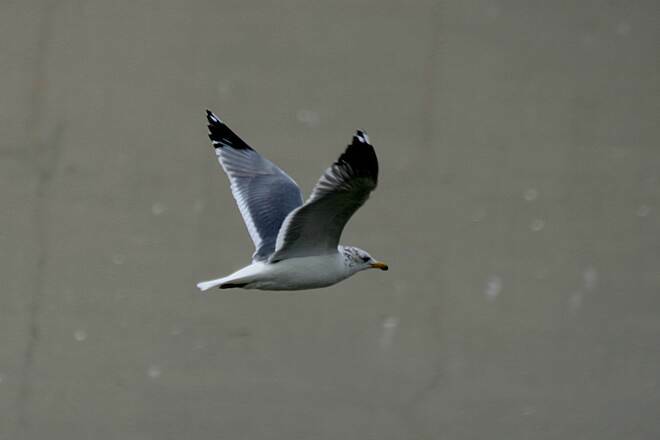 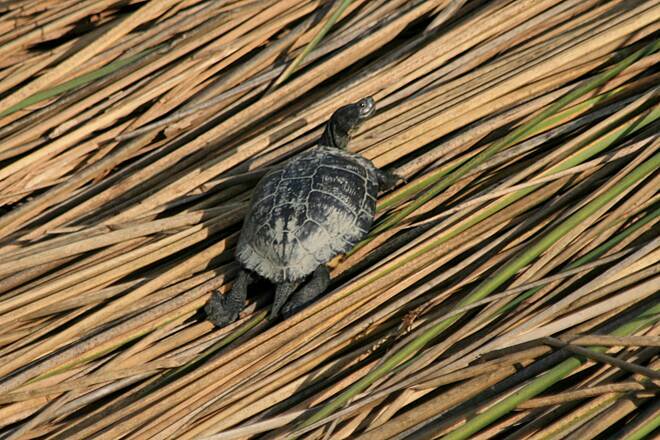 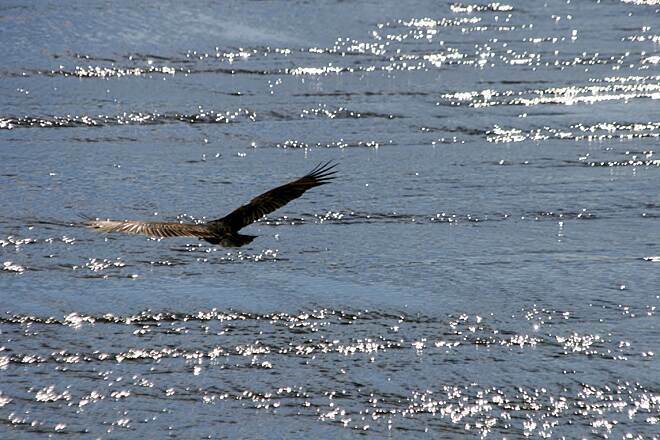 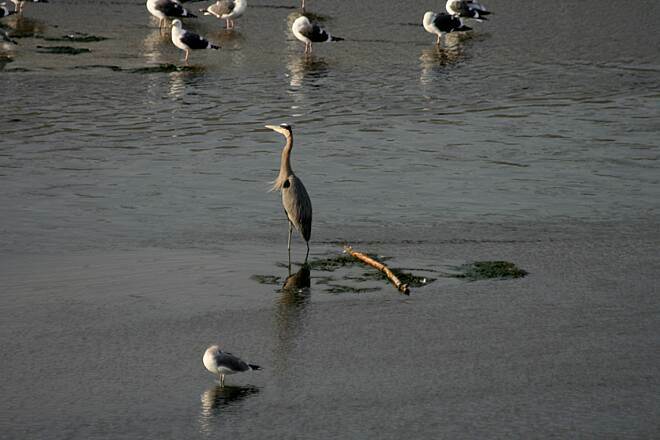 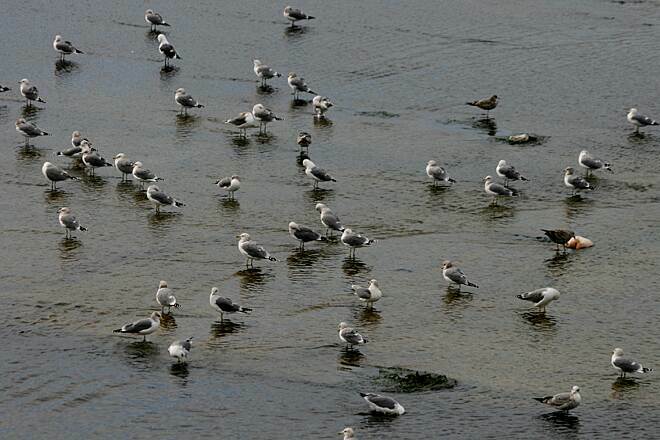 Channelized for nearly the entirety of its run through the highly urbanized area, the adjacent river is the subject of sizeable plans to restore the original habitat and open it to recreational use. 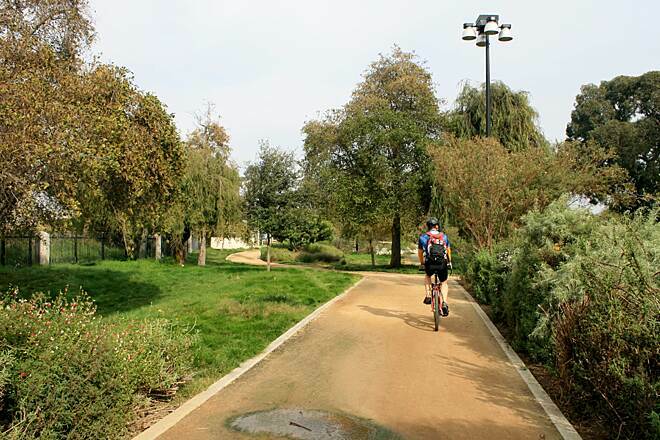 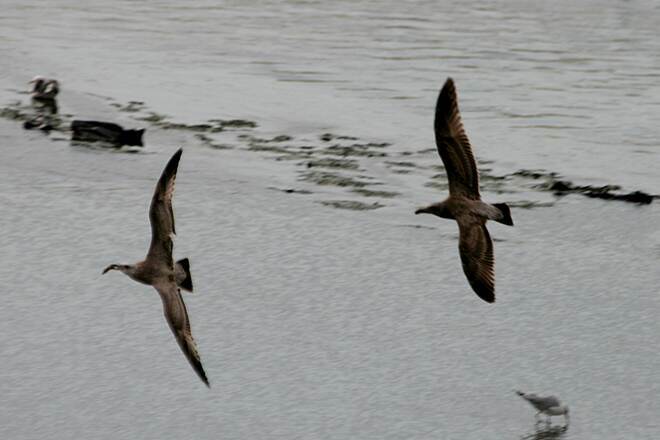 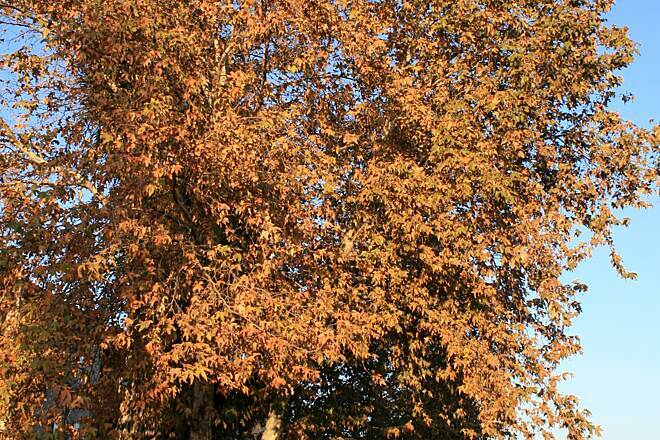 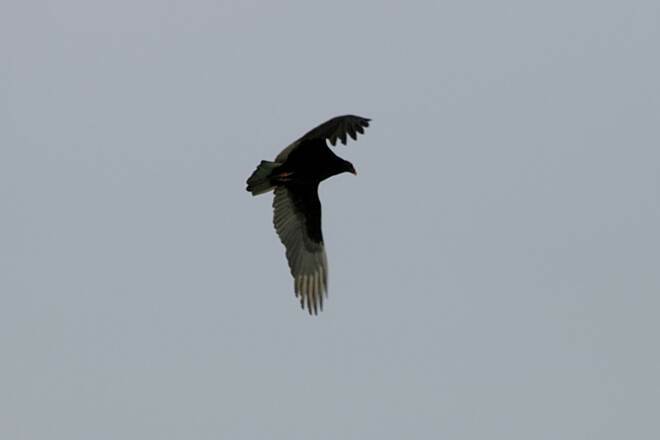 However, several new parks along the trail's route—all recently opened as part of the rehabilitation of the river and its immediate surroundings—do provide a pleasant diversion from the otherwise urban landscape. 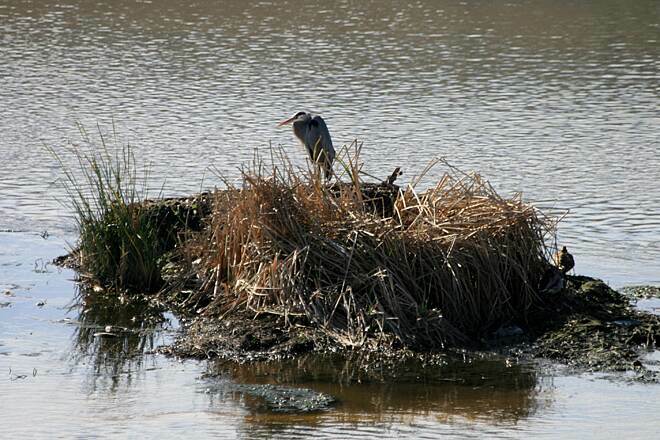 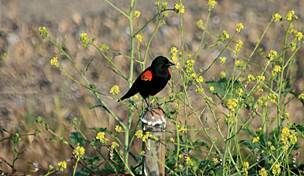 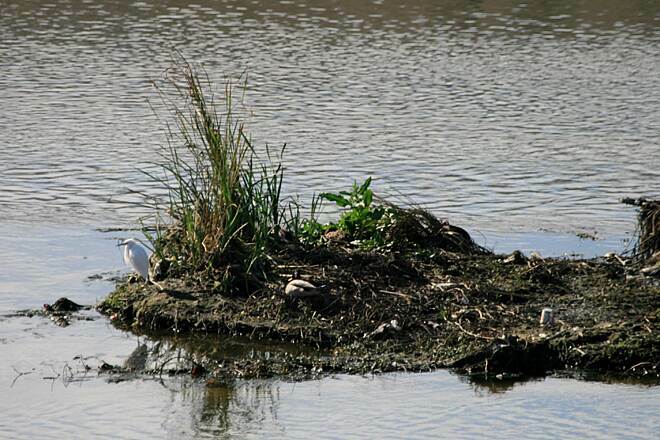 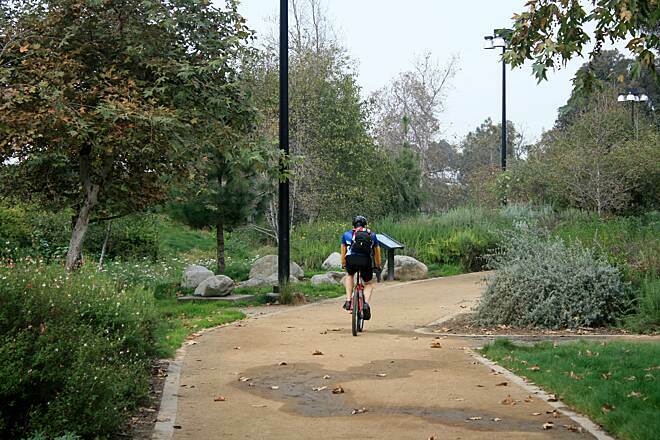 Sunnynook River Park offers a larger space to view native plants and trees, while Rattlesnake Park, Marsh Park, Elysian Valley Gateway Park (a particularly good spot to view the range of birds that call the area home) and Egret Park are smaller places to relax before you resume your trip. 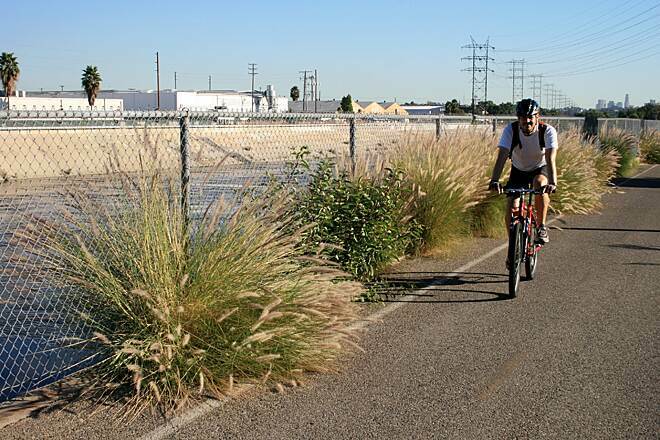 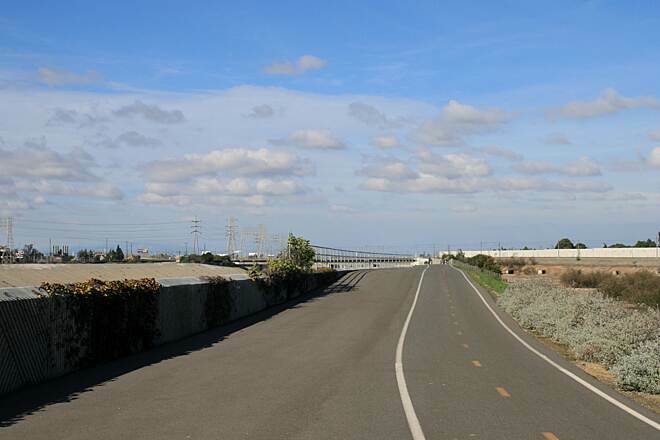 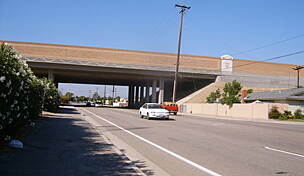 After a significant gap near downtown Los Angeles, the longer southern trail segment begins in almost exclusively industrial Vernon, the smallest incorporated city in California. 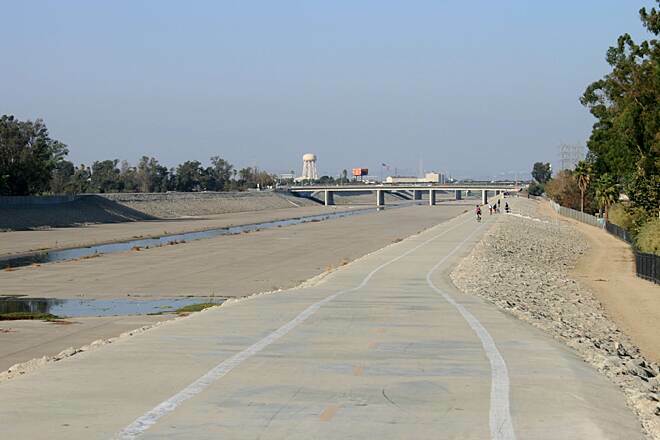 Like the northern portion, the trail continues south along the western side of the channelized river, but it soon crosses to the eastern side via the Imperial Highway's bridge. 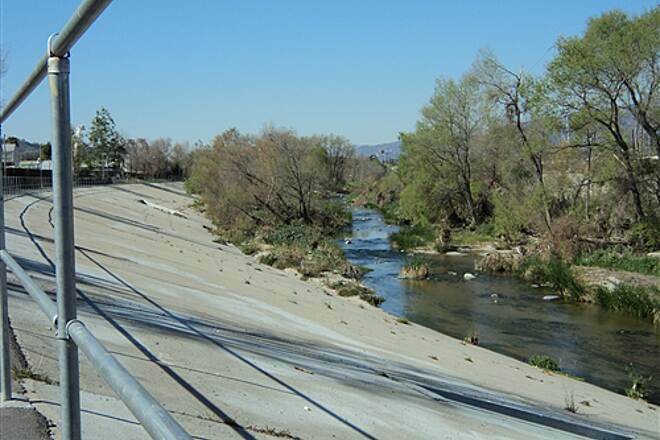 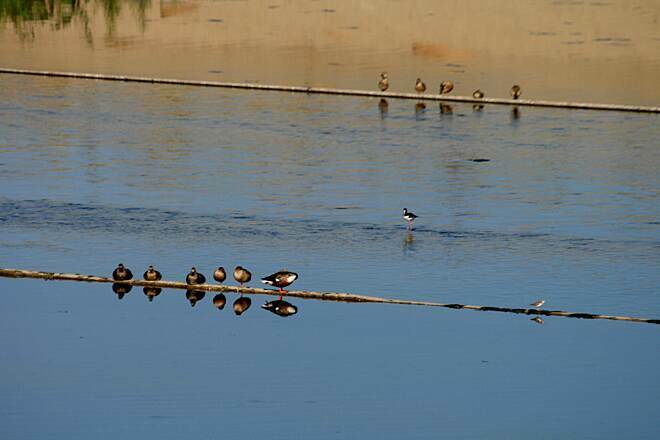 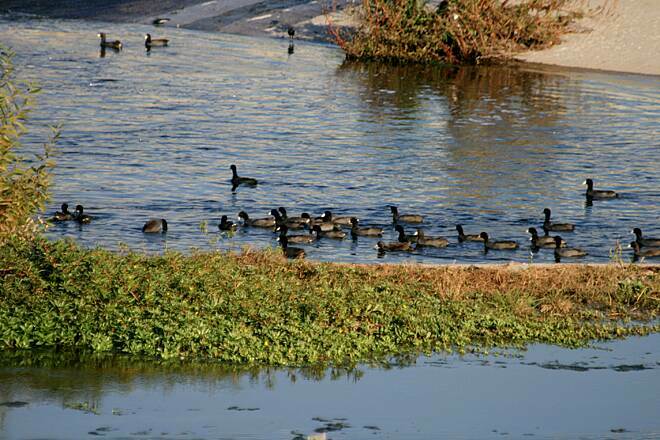 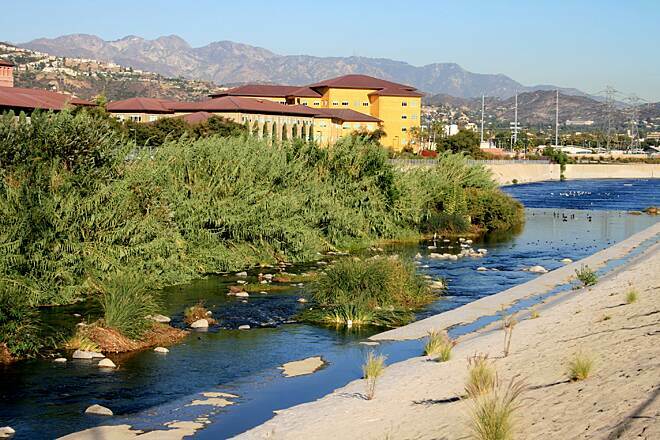 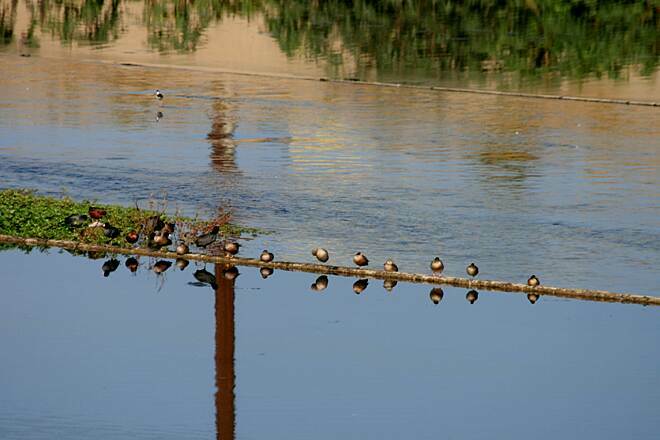 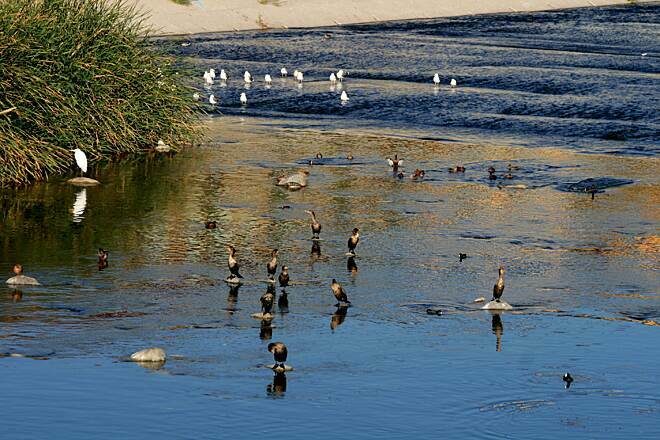 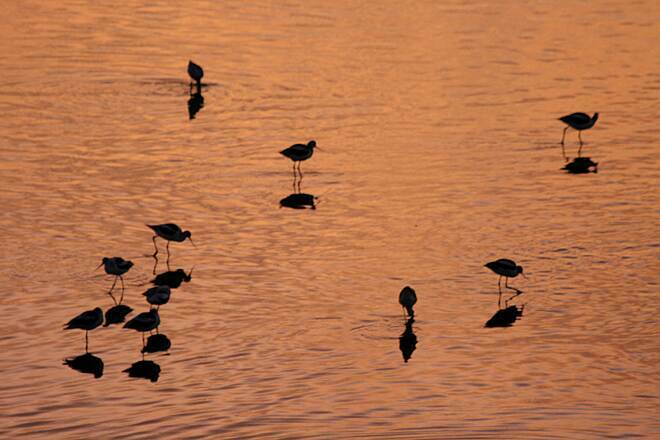 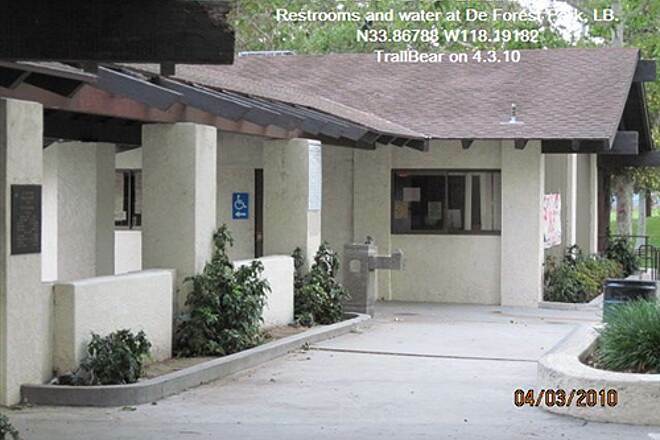 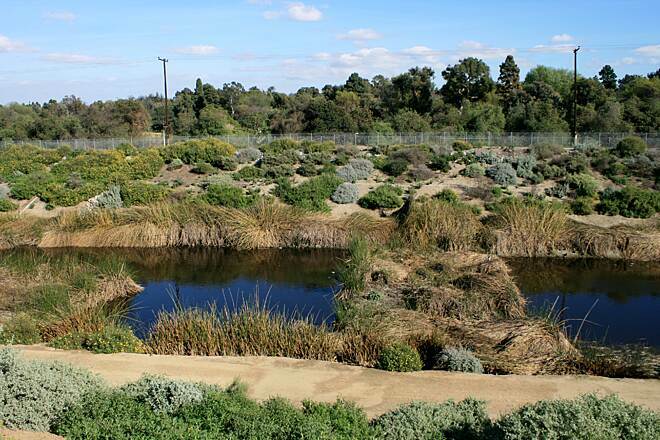 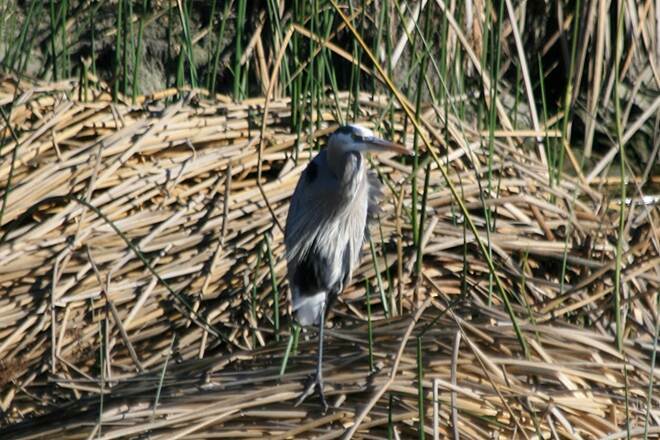 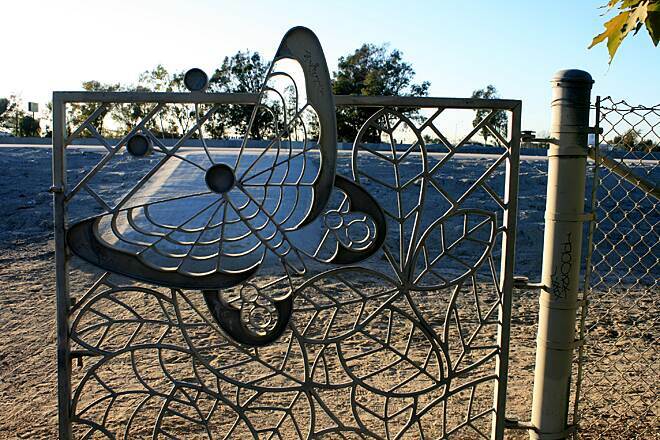 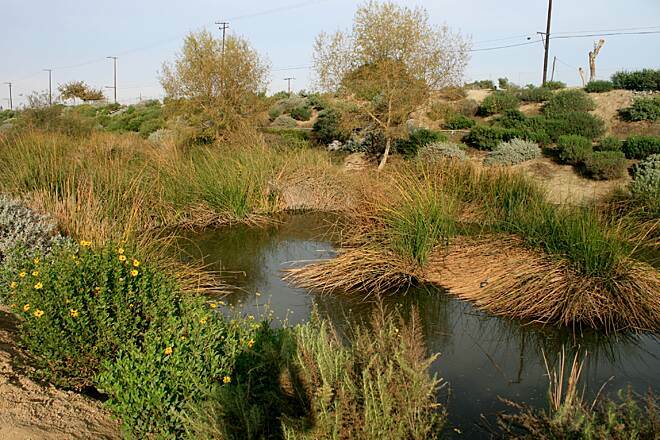 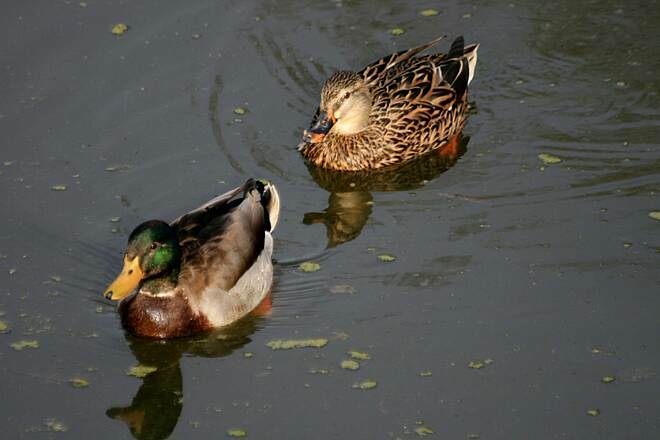 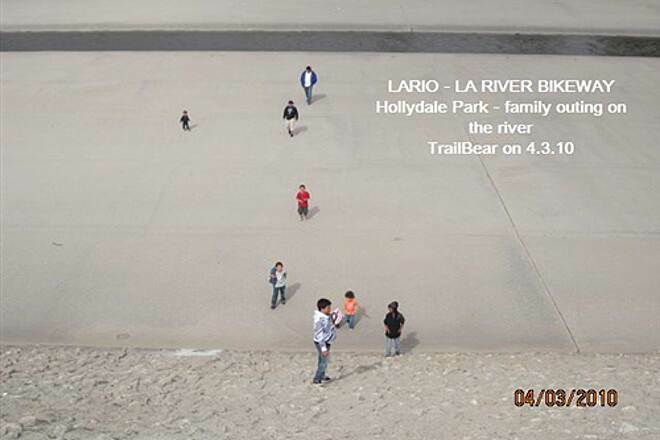 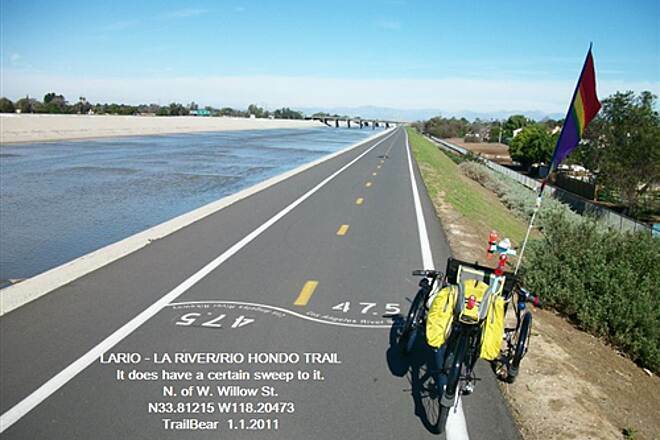 Here, it also meets the Rio Hondo River Trail, which heads northeast along its namesake tributary to the Whittier Narrows Recreation Area and beyond. 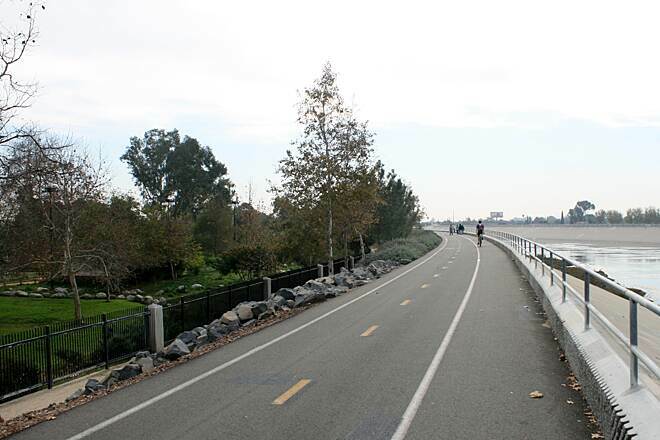 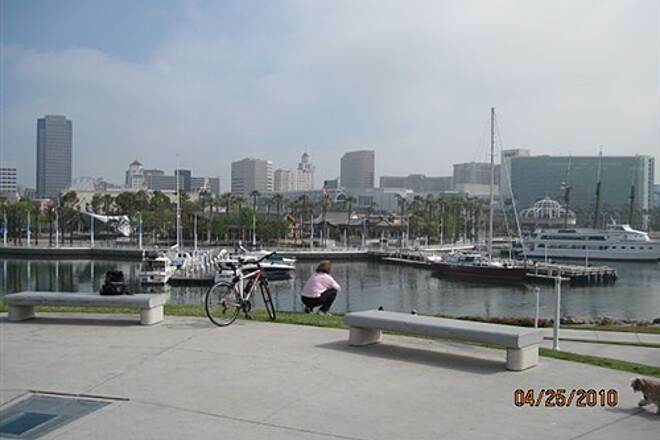 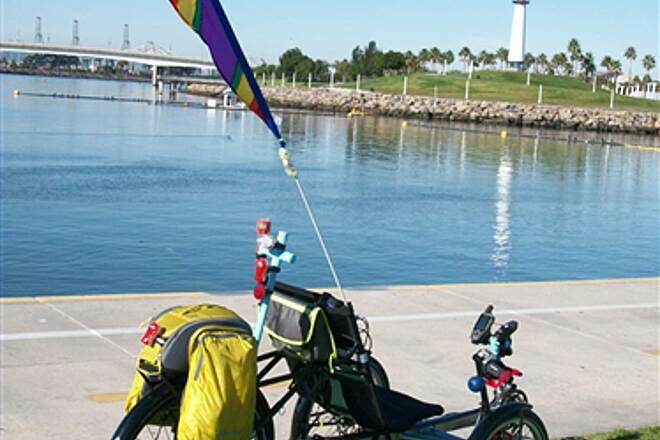 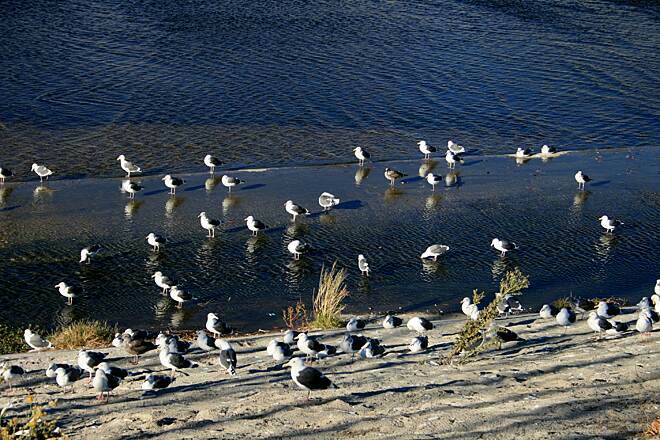 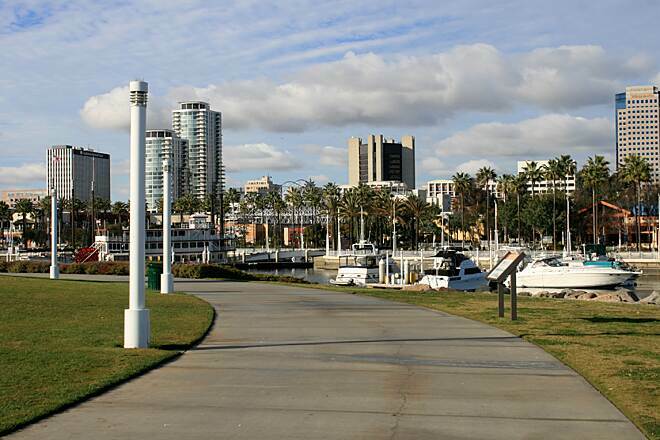 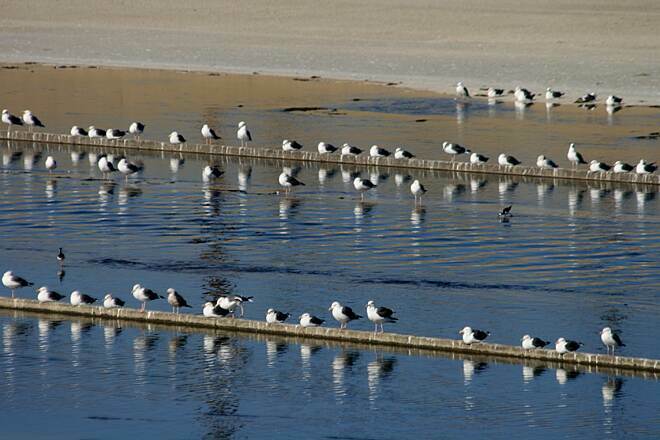 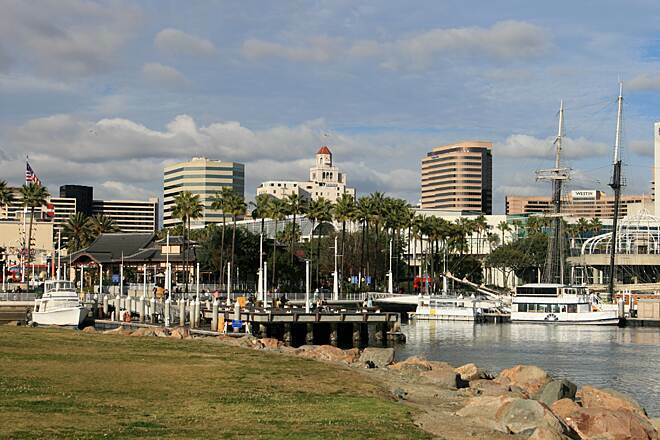 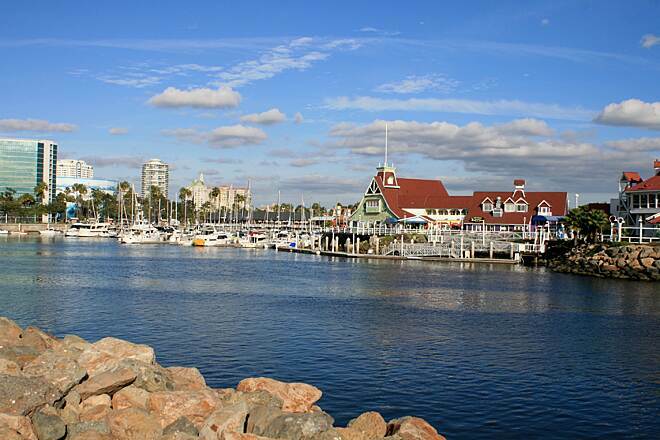 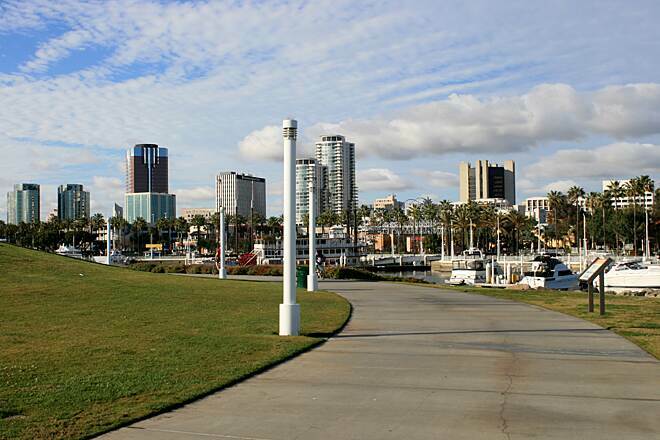 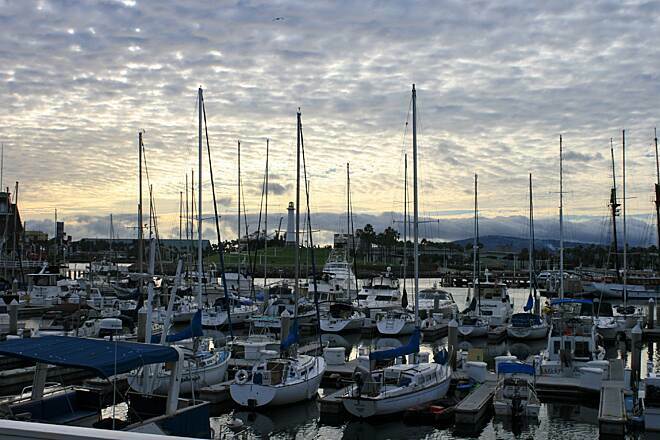 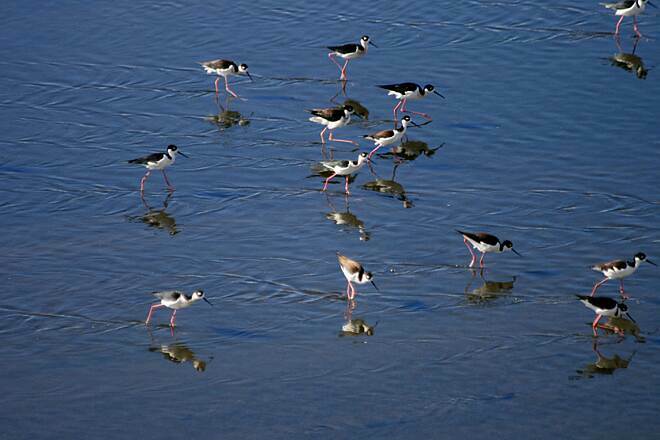 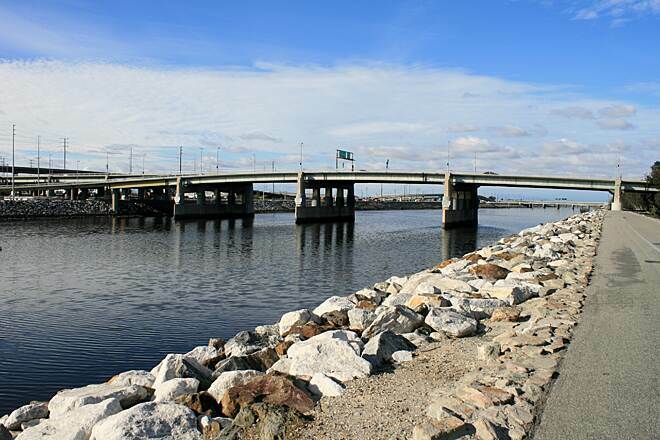 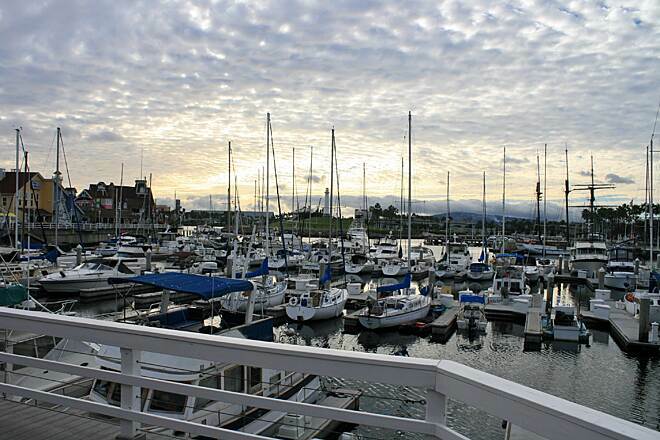 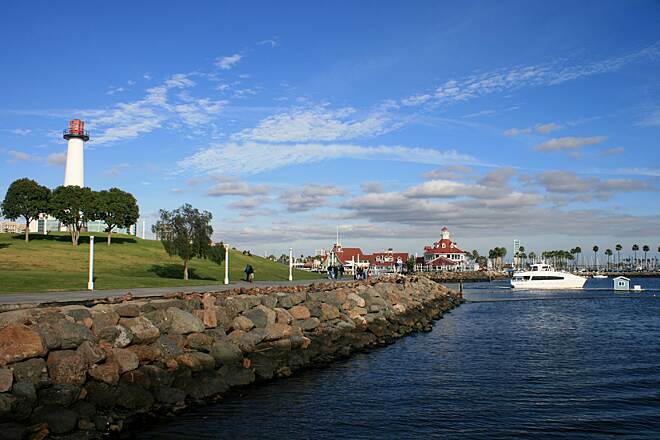 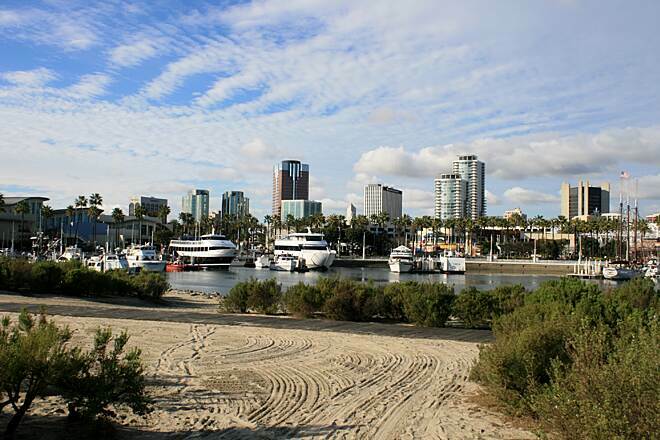 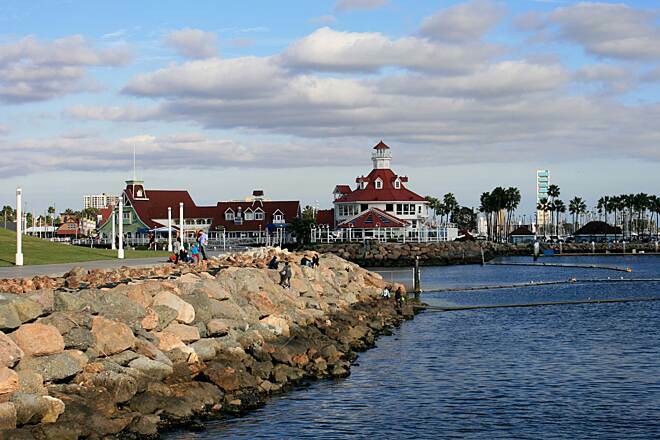 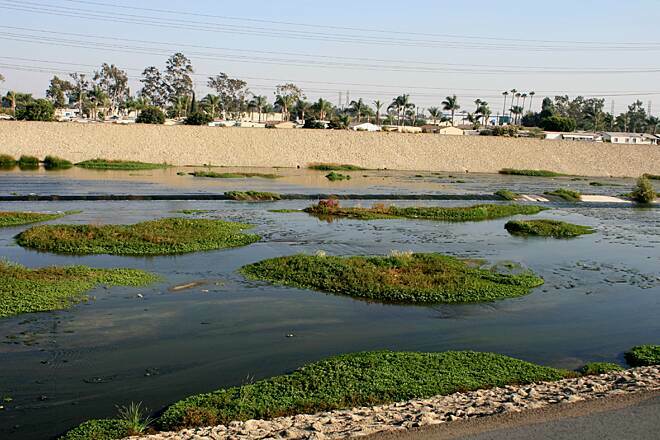 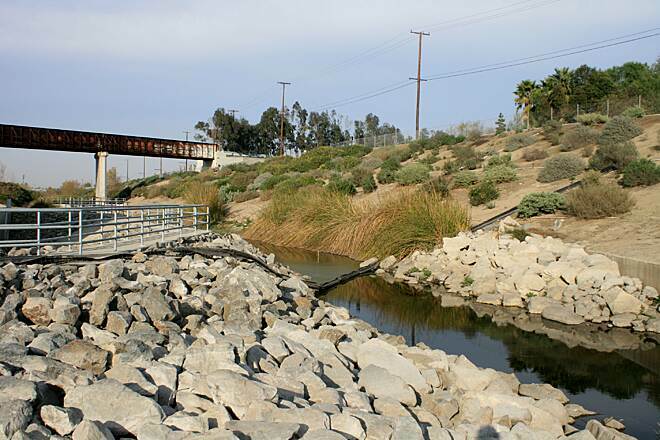 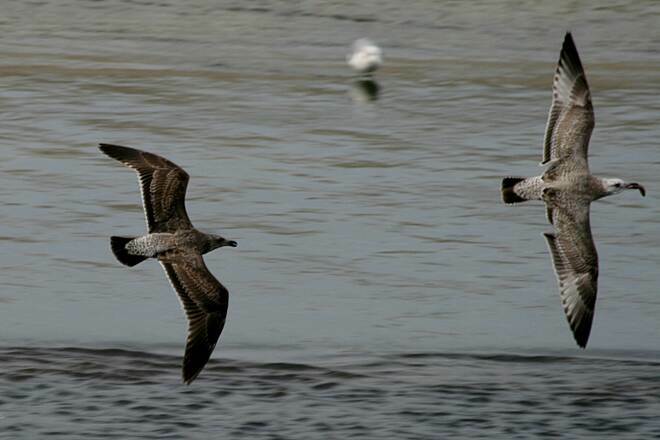 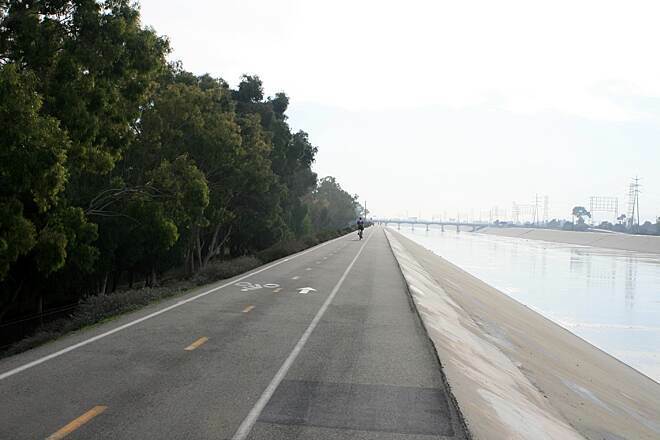 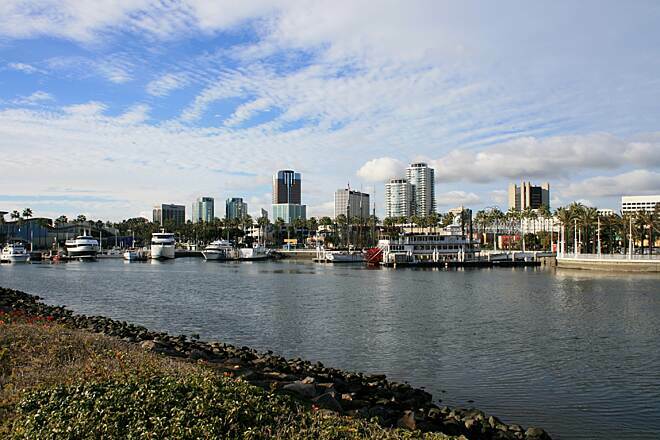 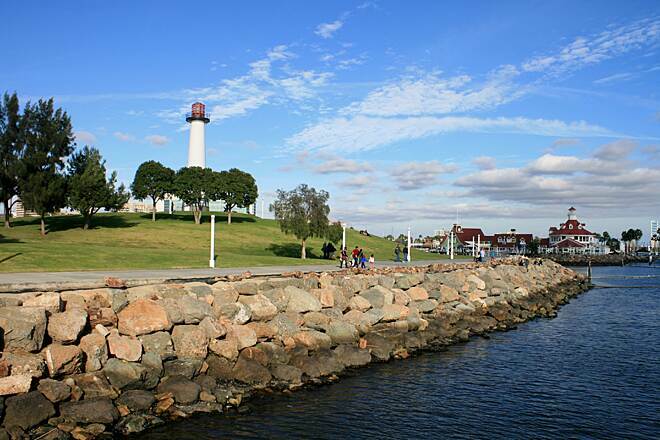 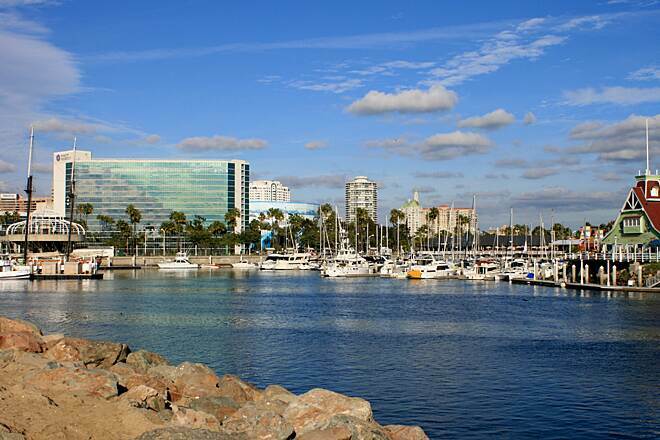 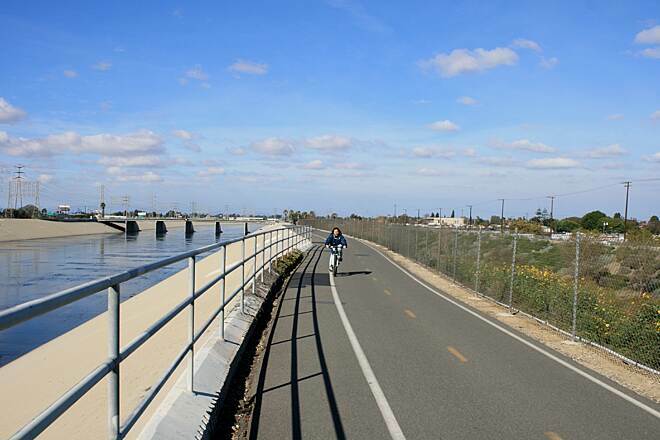 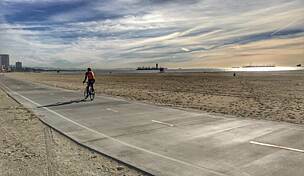 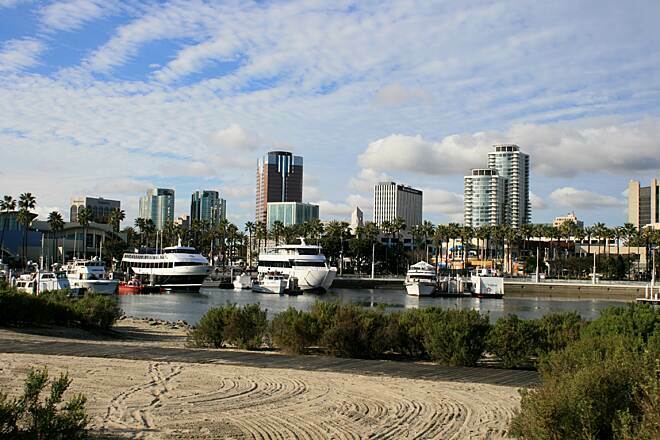 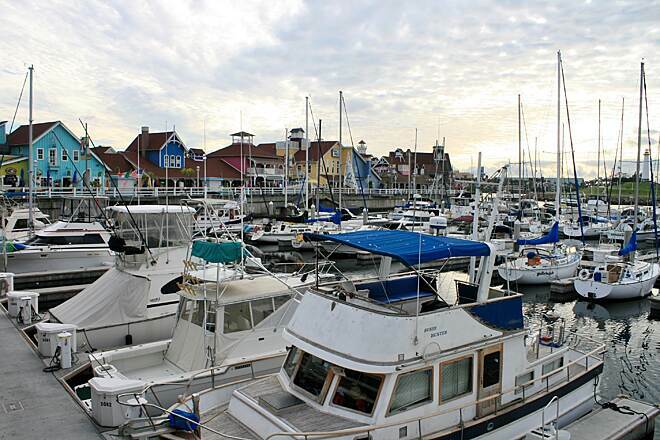 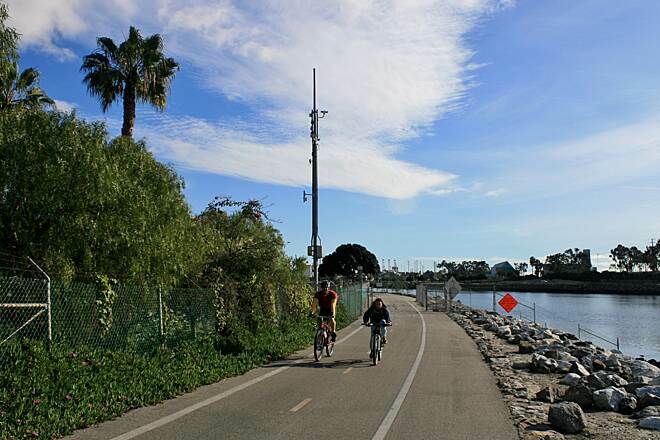 Continuing south through a variety of natural and industrial landscapes, the Los Angeles River Trail ultimately ends with the river at the Pacific Ocean in Long Beach, where it connects to the city's extensive waterfront trail network. 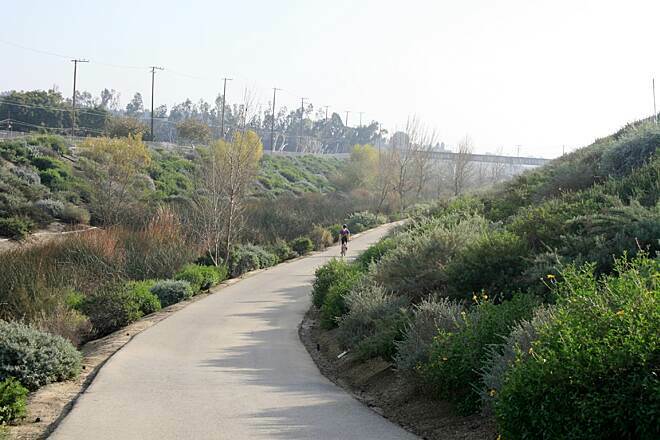 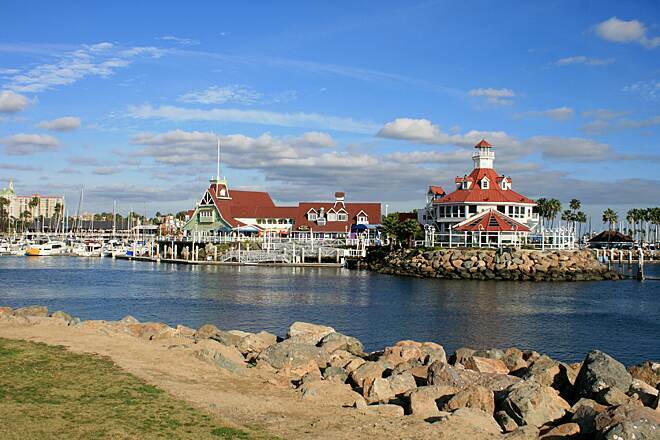 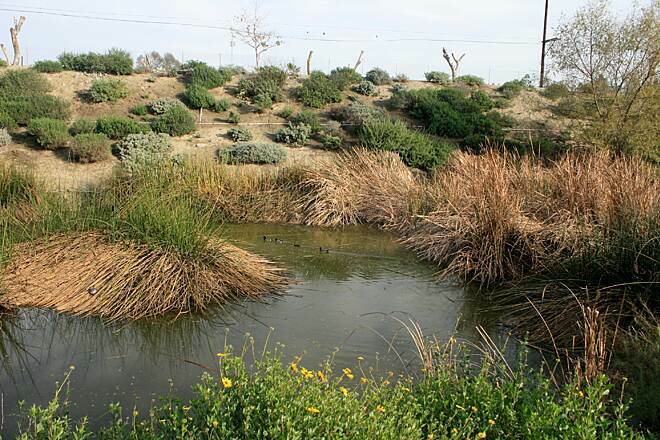 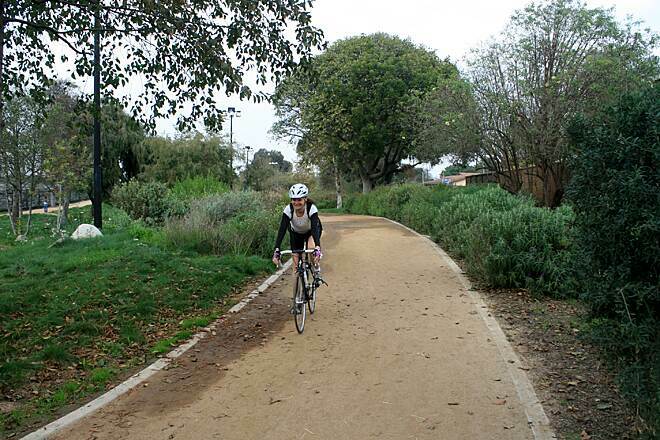 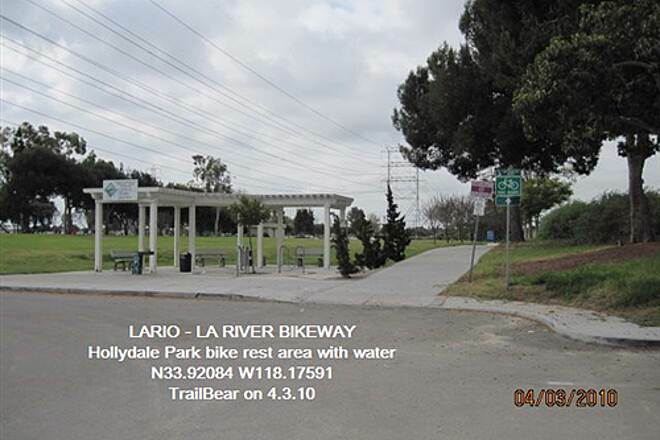 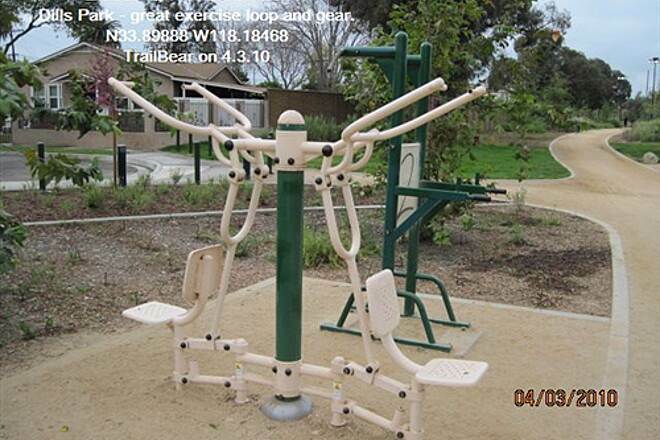 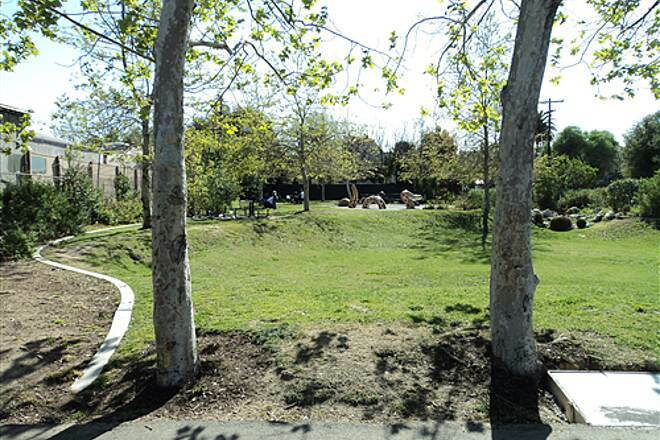 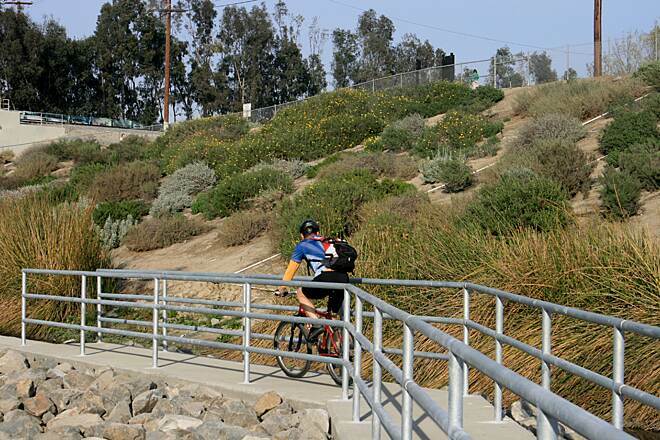 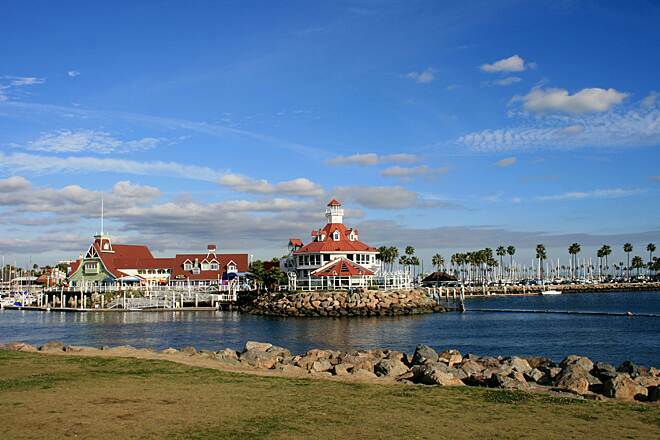 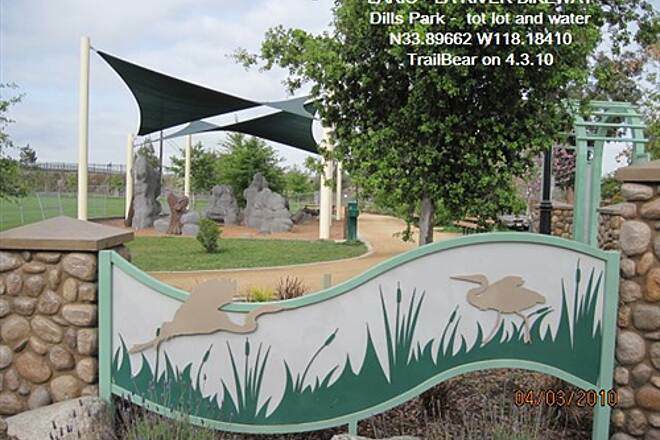 Like the northern segment, the southern trail section links to several parks along the way, including the sprawling Hollydale Park in South Gate, scenic Ralph C. Dills Park in Paramount and pleasant DeForest Park in Long Beach. 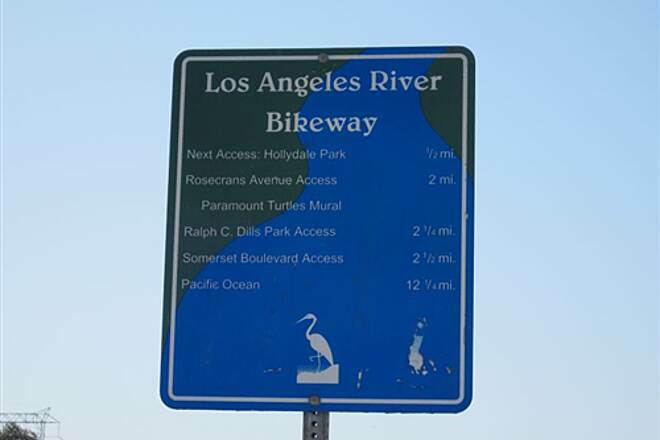 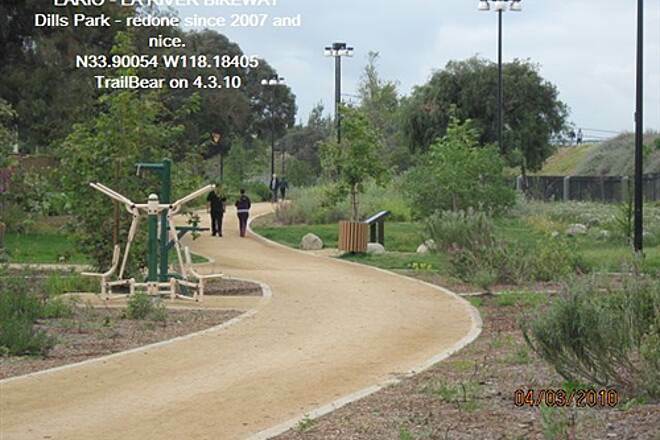 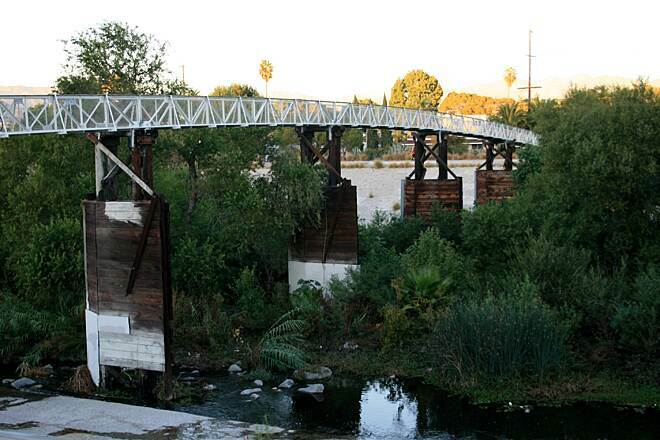 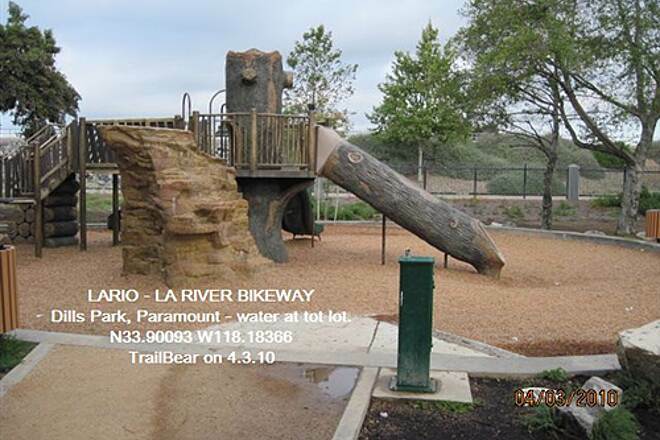 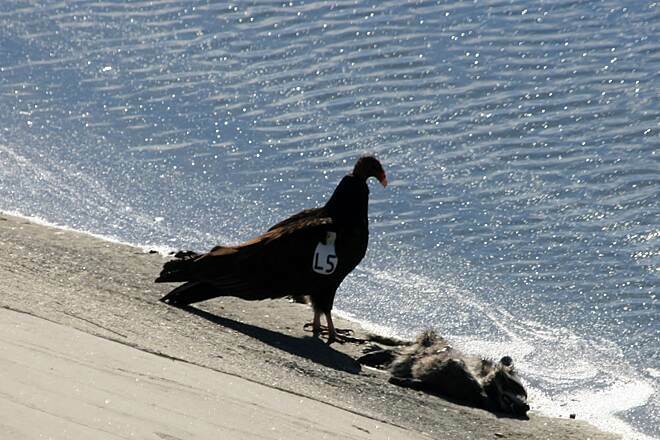 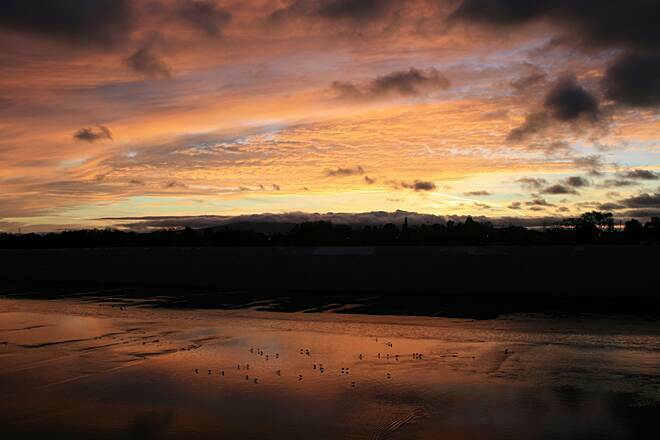 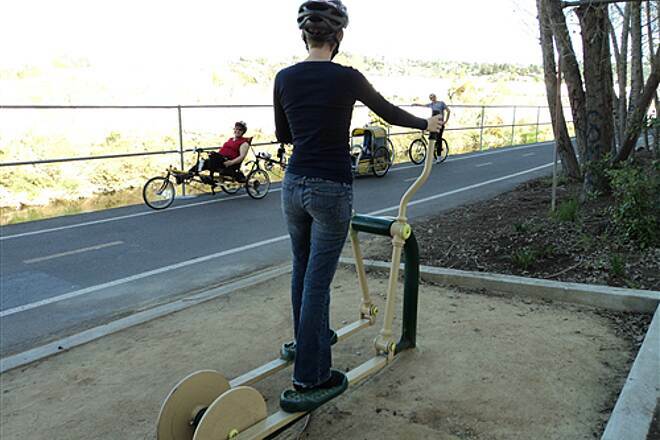 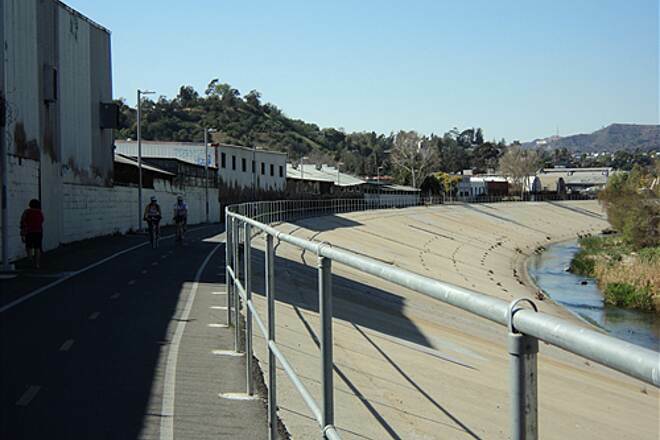 Parking for the northern section of the Los Angeles River Trail is available at Marsh Park in Los Angeles (2999 Rosanna Street/2944 Gleneden Street). 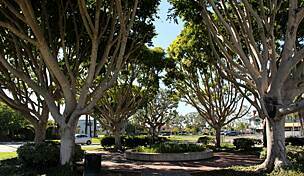 For the southern section, parking can be found at Hollydale Park in South Gate (5400 Monroe Avenue), Ralph C. Dills Park in Paramount (6500 San Juan Street) and DeForest Park in Long Beach (6255 DeForest Avenue). 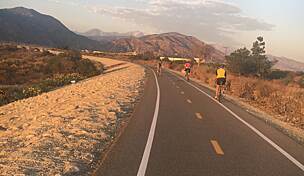 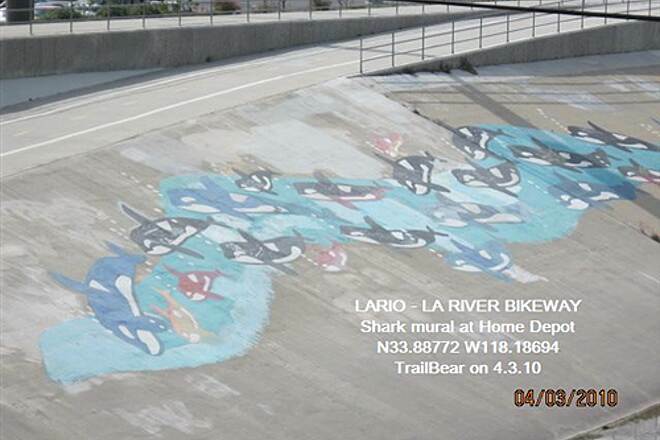 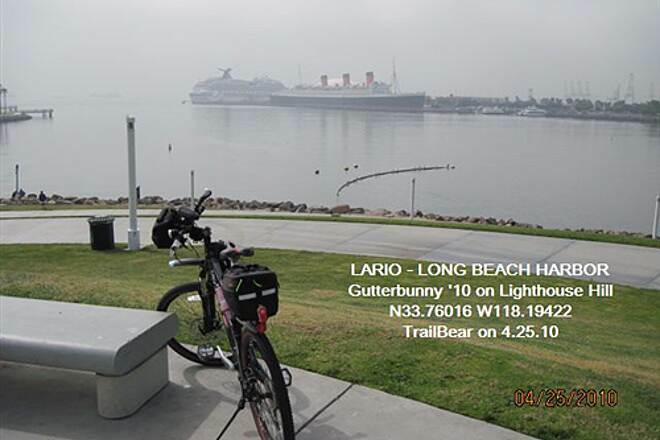 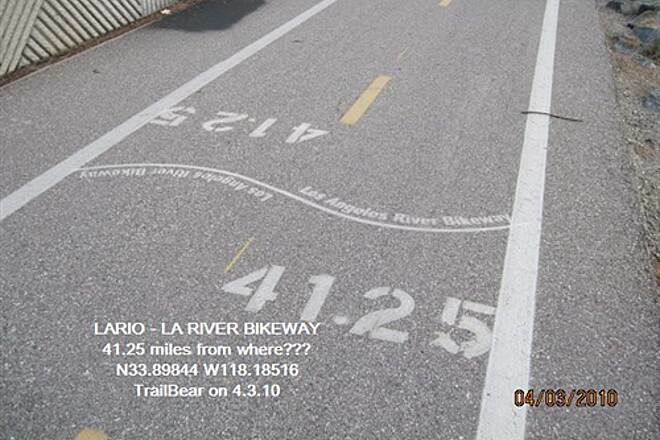 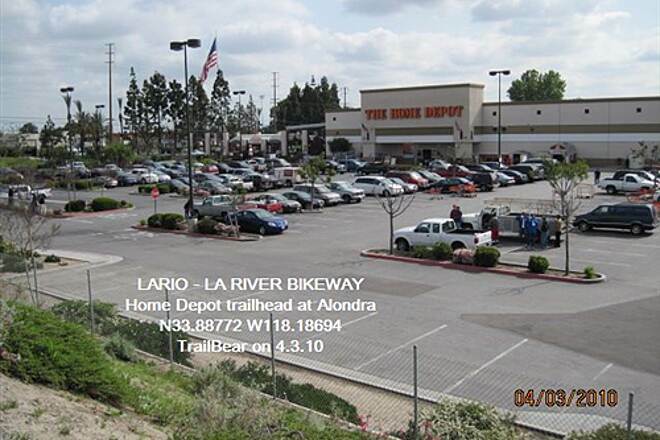 I have ridden the northern part of the trail (San Fernando Bl to the LA Zoo) for a couple years. 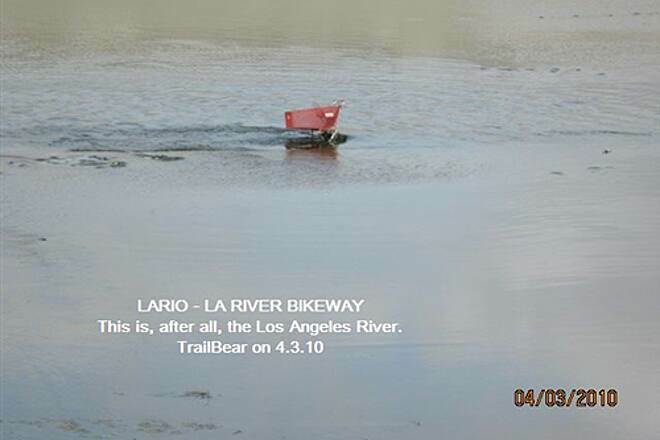 This is a great ride. 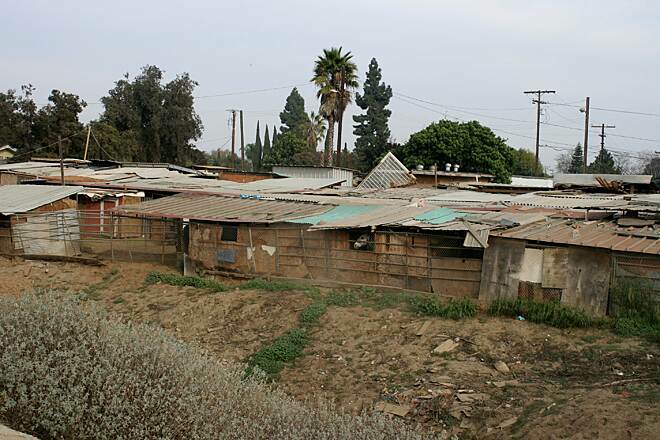 There is one homeless encampment towards Los Feliz. 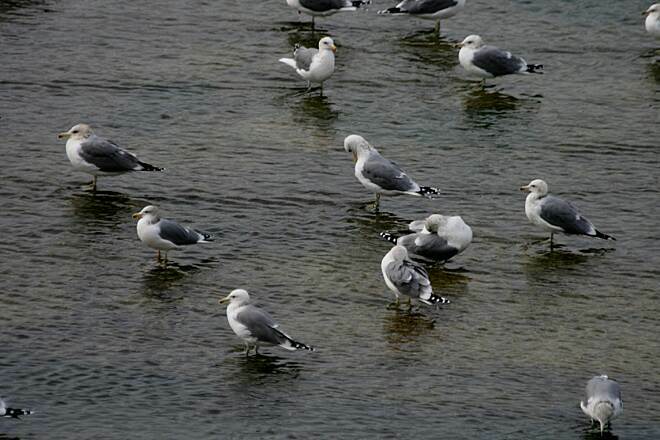 I have never felt threatened by anybody. 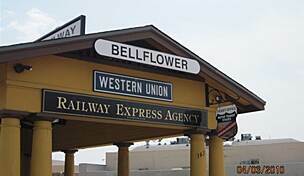 Nor have I ever seen drugs exchanged. 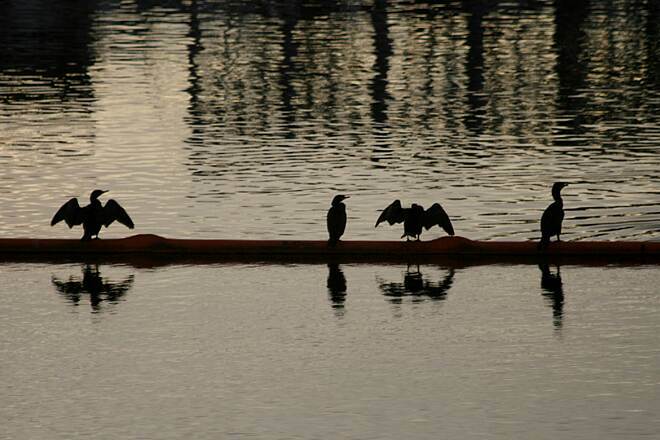 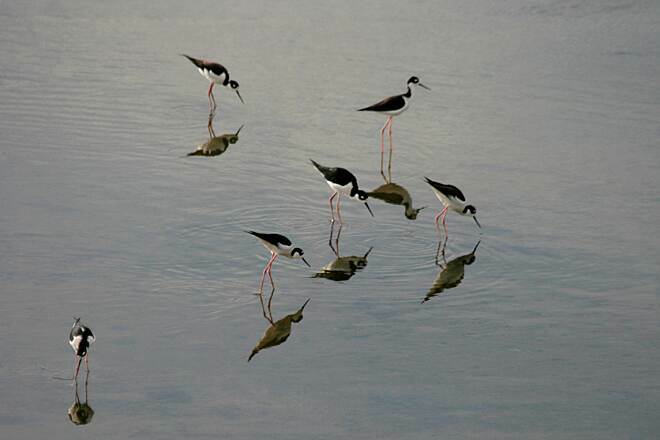 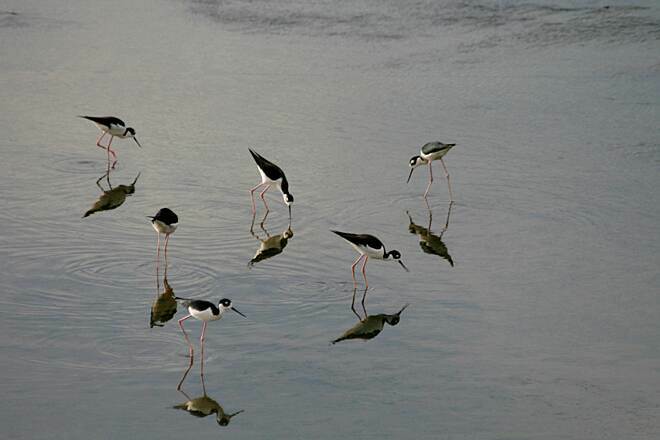 These are just poor souls trying to get by. 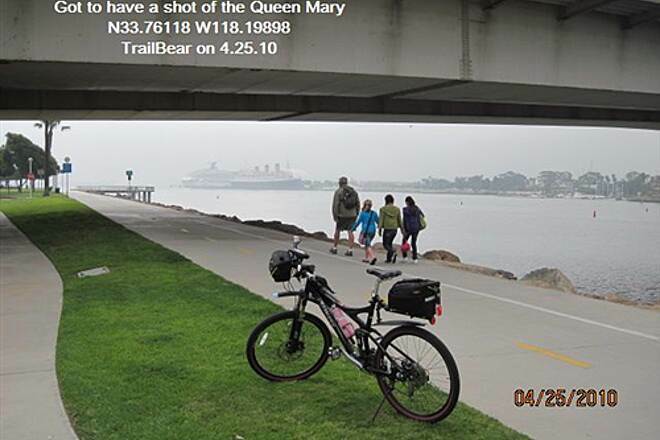 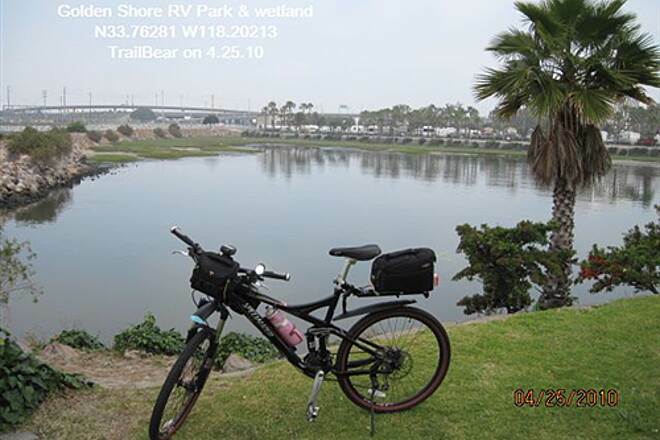 I recently purchased a rode bike and have made afew trips from my home in Compton to Belmont Shores round trip, there are homeless people at several locations along the trail. 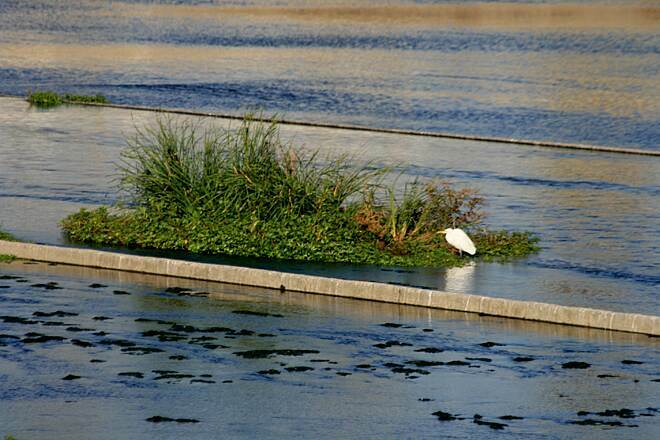 Be very careful where you stop and rest. 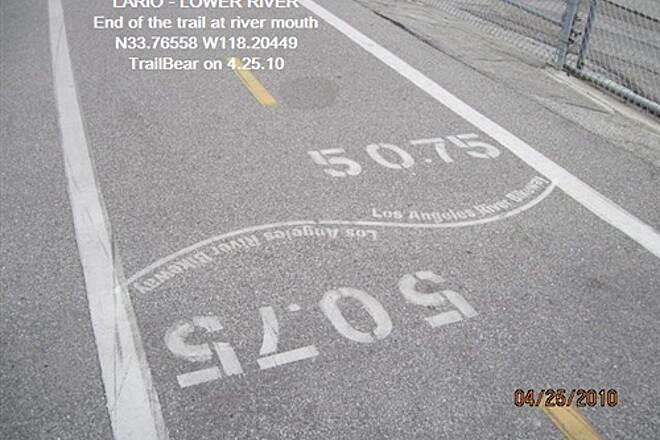 I will try the trail going north soon and report back. 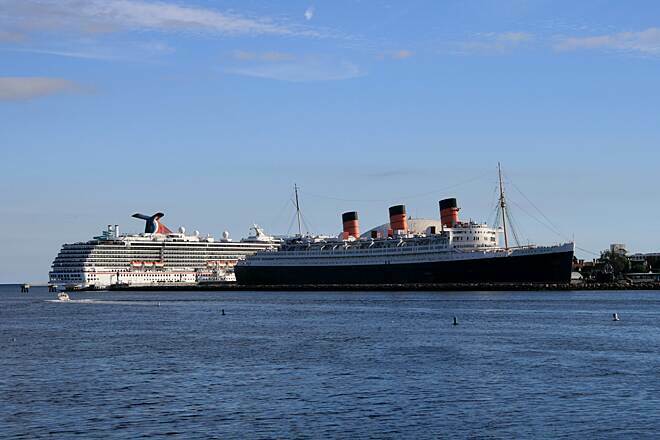 Travel with some friends to be safe. 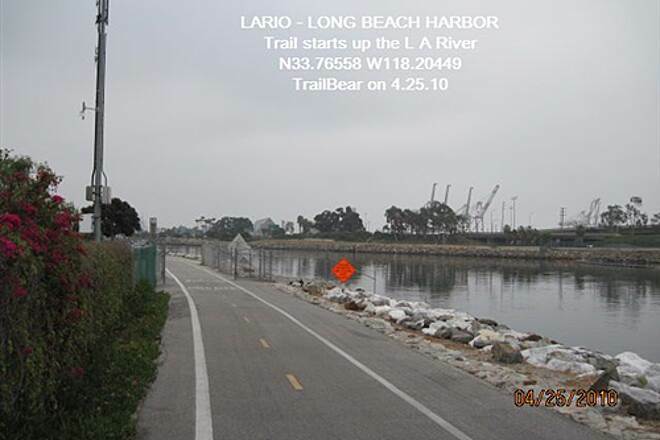 I visited Long Beach this year and took a bike ride up this trail from Long Beach. 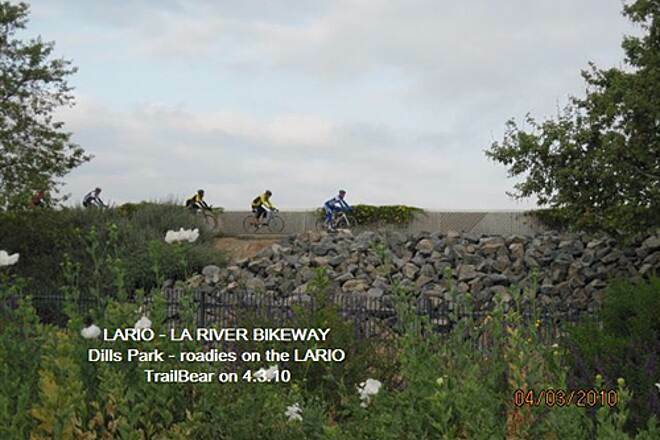 I no more than got on the trail and was harassed by people on the trail. 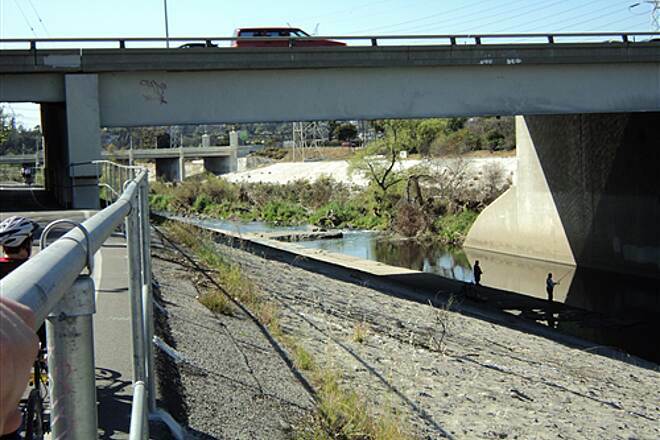 I'll assume they were homeless. 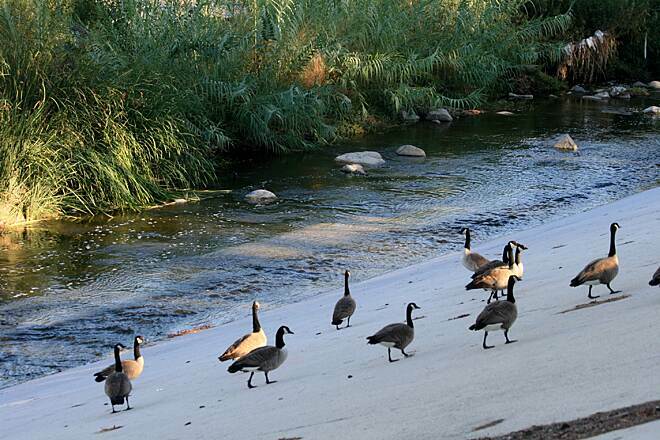 They yelled at me to never come back there again. 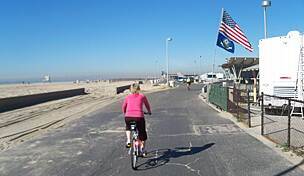 I ran into a Marine Policeman and told him and he just said to just ride along the beach area of Long Beach that those people have a right to be there also. 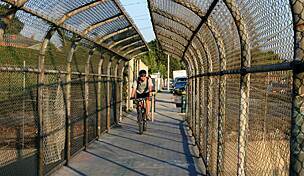 He said he can chase them away or I could press charges. 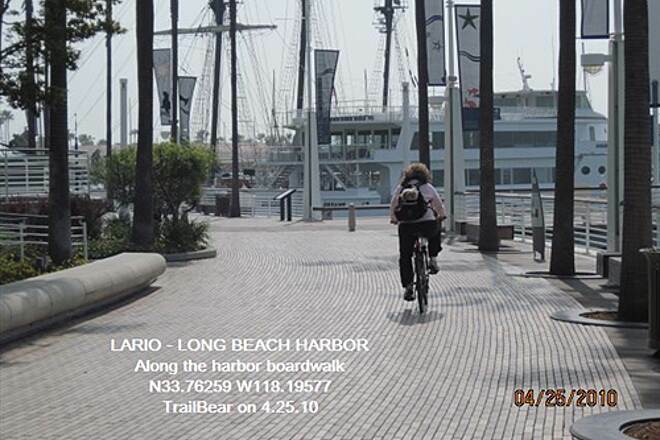 Another person that was riding there said one of the people actually grabbed and stole a water bottle from their bike as they rode by. 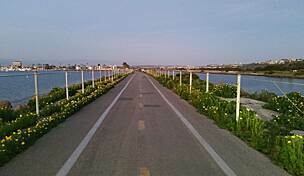 This bike path is great plenty of stops even locations for food drinks repairs along the route stop off at frog stop. 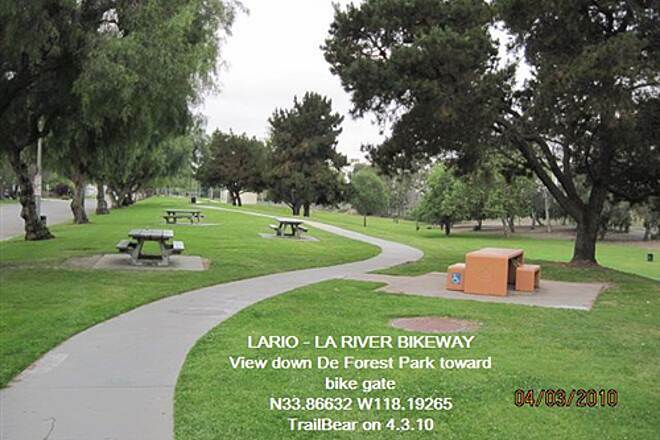 Took the kids first time on the trail starting at the Los Feliz Golf area. 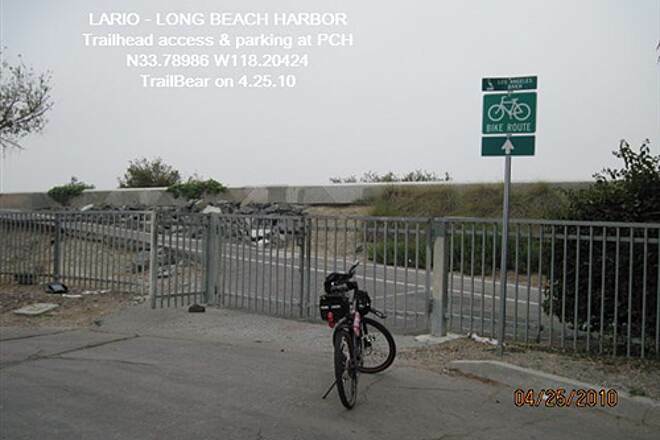 Parked and had to walk bikes up the entrance hill, on sidewalk and into entrance. 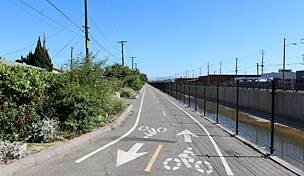 I like the paved bike trail and riding along a river is nice, but up until you have a lot of homeless people along path in the bushes, in the river islands and lots of pee smells. 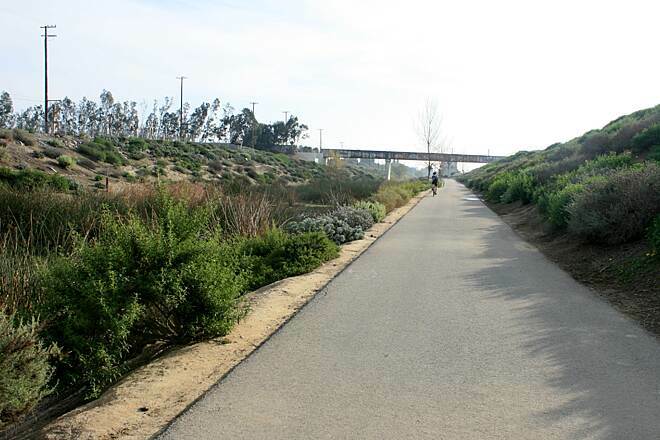 It makes me feel uneasy to see drugees trading drugs right on the path. 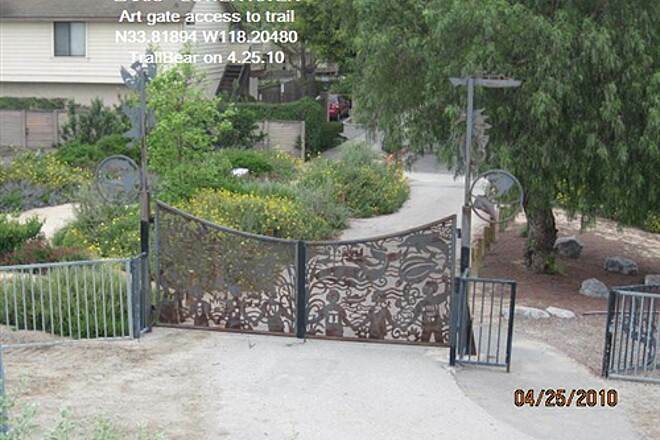 I don't think I'll use this los Feliz entrance again. 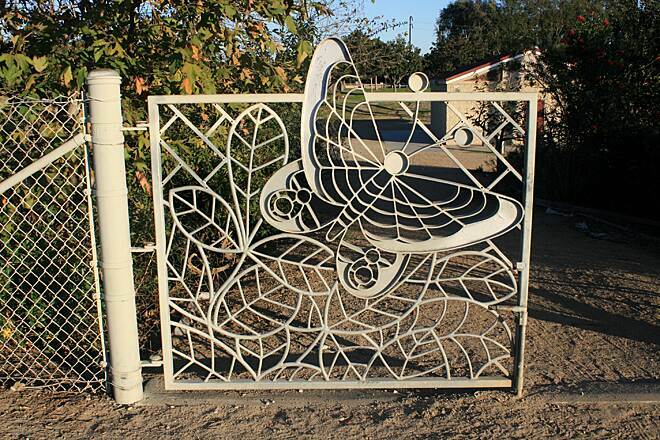 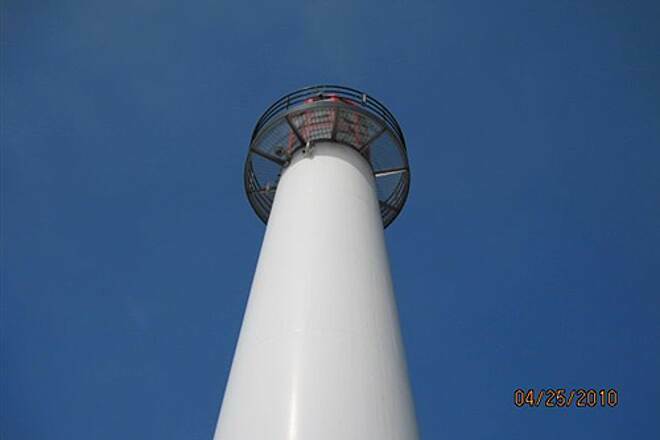 We'll have to find a safer more comfortable way to enter and enjoy. 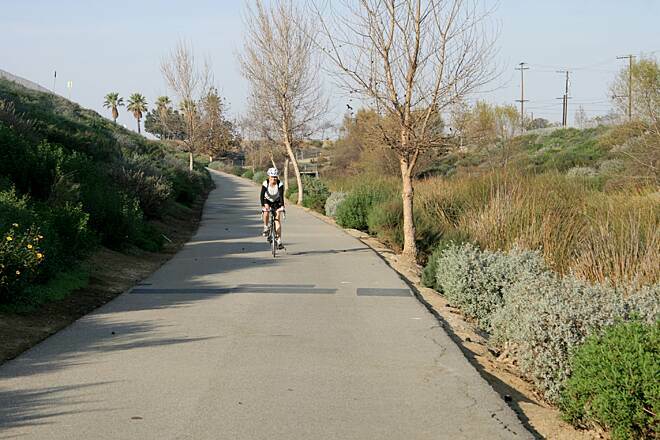 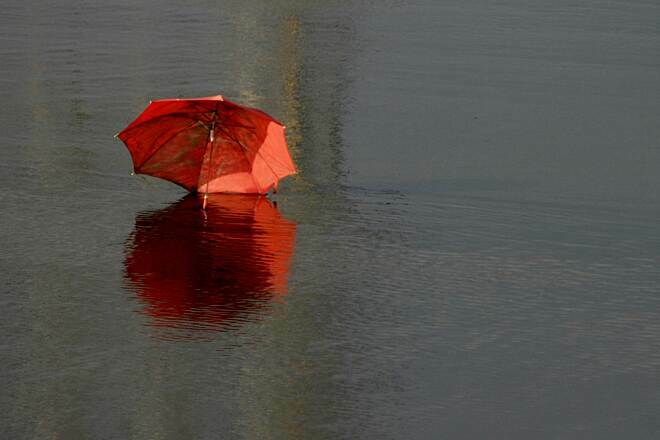 Dont ride path alone. 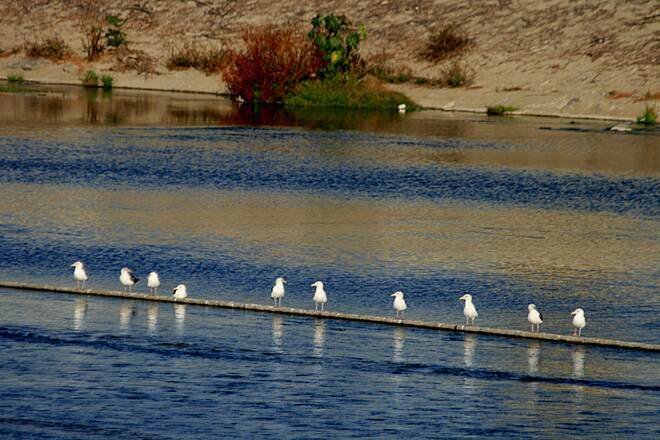 It can be intimidating. 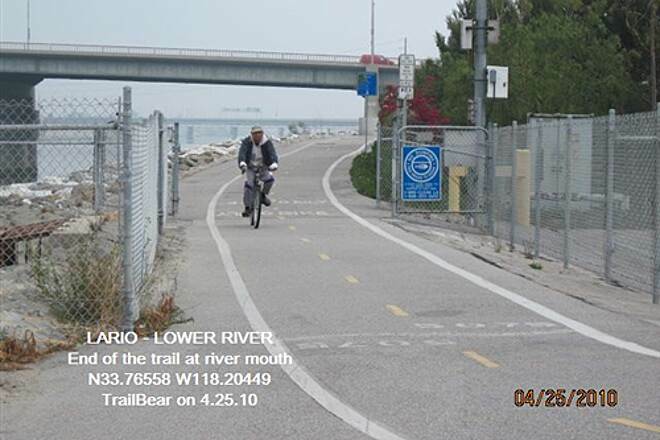 Or ride fast past the homeless and the tweeker section. 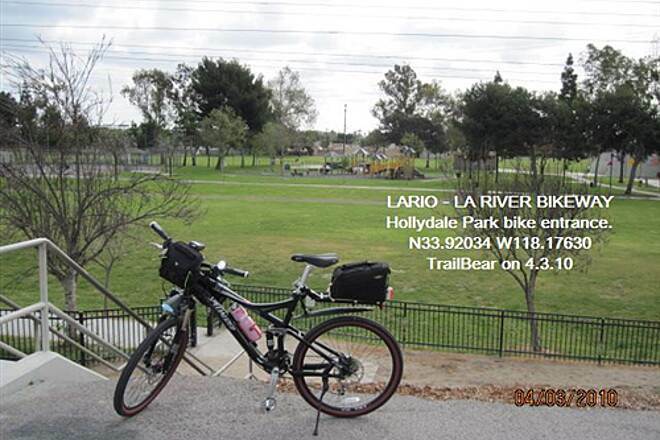 I did this trail a few years ago and it is a very nice ride. 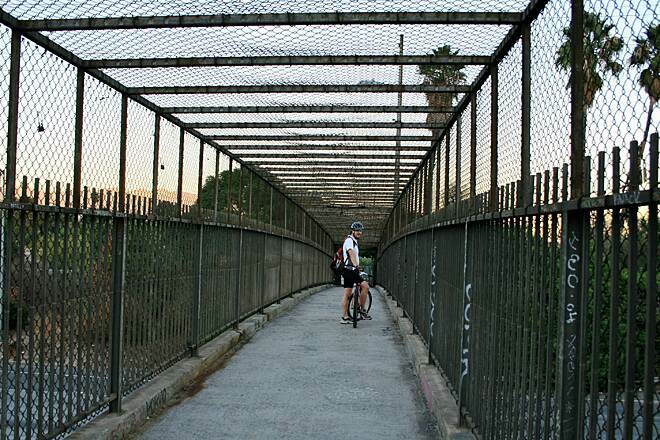 I rode my bike over from Burbank and did the round trip and it was a very good work out. 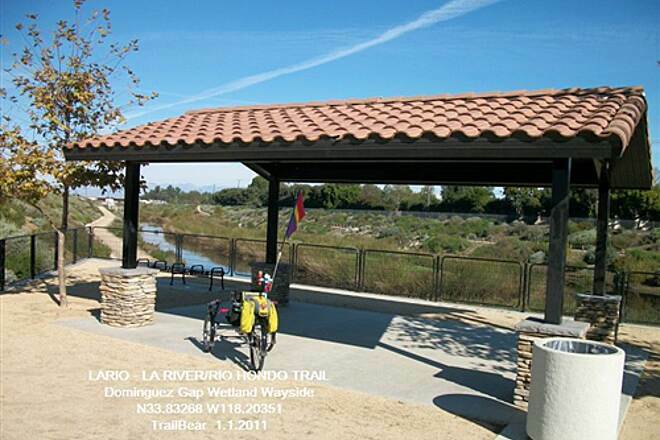 I was some what taken back that no one has done a review as the trail gets a lot of traffic.